This post has a lovely story. 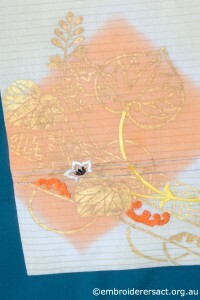 One of our members Irene Burton has a treasured Japanese friend Keiko. Last September Irene received a surprise gift from Keiko – a Japanese obi. This is a long wide sash which is traditionally used to secure a kimono around the waist. Did you enjoy looking at the obi? 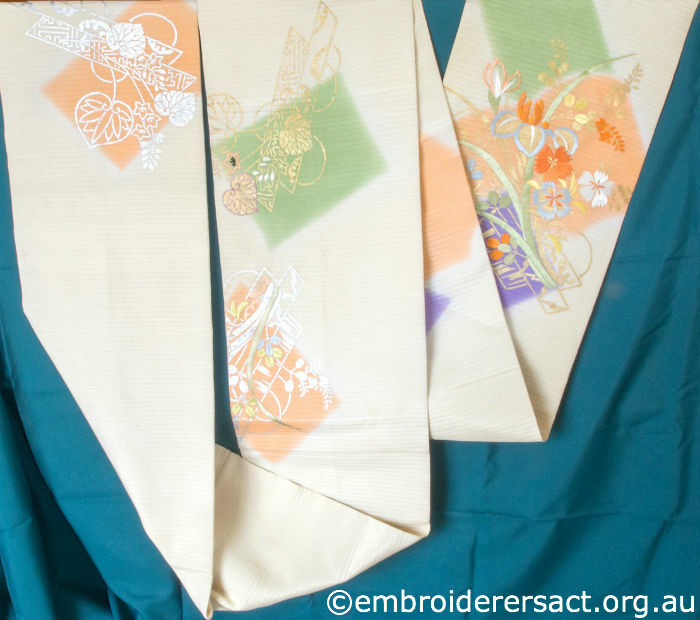 Irene – thank you for sharing with us the story of your friendship with Keiko and her awesome gift of the obi. It’s very special. 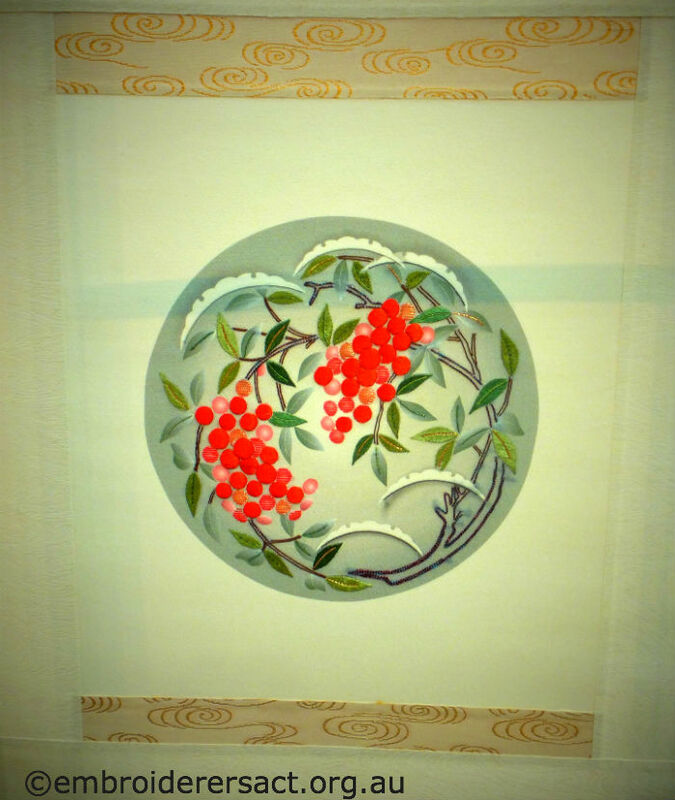 Keikosan – arigato (thanks) and a deep bow. The first signs of autumn have arrived here in Canberra over the last week. There’s a chill in the morning air, the light’s changing from the brilliance of summer to the softer golden tones of autumn and the Gang Gang Cockatoos with their ‘squeaky door’ calls are everywhere – back from their summer sojourn in the mountains. There’s been so much creativity going on in the Guild that it’s been hard to find the time and opportunity to get back to writing about Italia Invita. This is the first of two new posts and then the series will be complete. 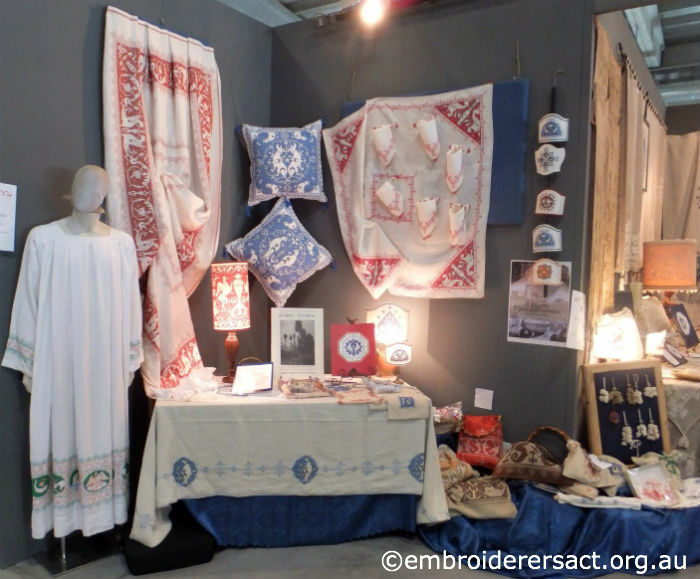 This post needs to come with a warning – there’s a lot going on in Umbrian textiles so this post is a bit epic to say the least……..
Perugia is a beautiful medieval city in Umbria. 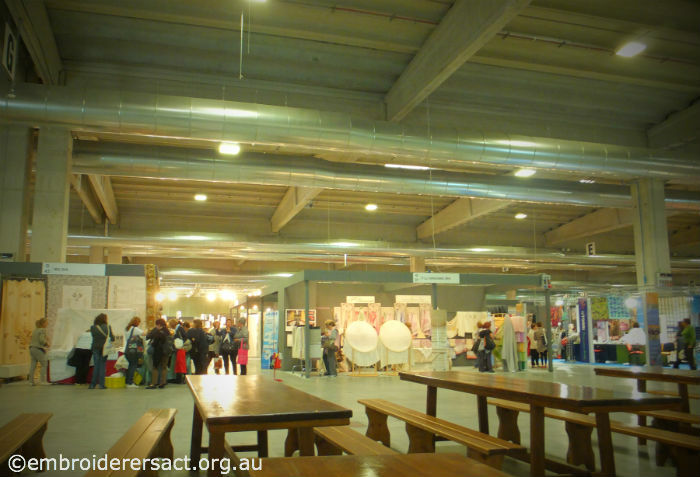 It has a famous chocolate festival and wonderful textiles – what’s not to love?! 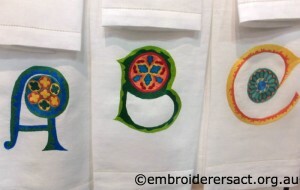 As the name suggests Punto Perugino is associated with Perugia and the history of this embroidery technique is interwoven with that of the city’s literature, art and agriculture. 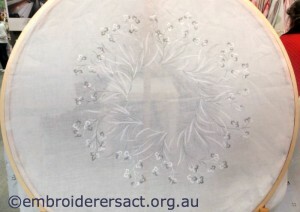 It’s a counted satin stitch technique on even weave fabric. Designs can also use cutwork and eyelets, bullion knots and curl stitch. 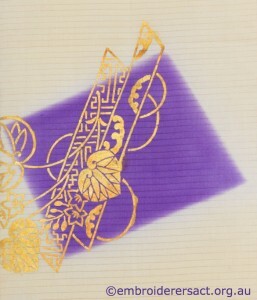 The patterns are geometric and larger scale designs can also have strong figurative elements such as birds, animals, flowers and mythological creatures. These come from the medieval art and literature of Perugia. 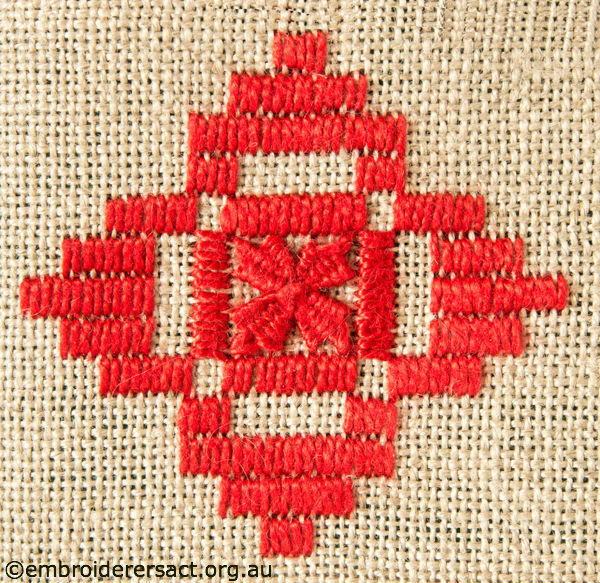 Meryl is an amazingly talented stitcher across a whole range of embroidery styles and she’s been showing me how to do this motif. 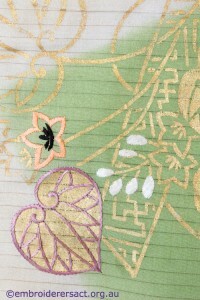 We just have to find some time to photograph the process and put it in the Tips and Techniques section. Until recently there wasn’t much detail known about the history of Perugino but then a conversation between researchers from the Punti d’Arte Workshop and a nun at the local convent of the Poor Clares led to the discovery of some historic pieces preserved by the nuns. These take the provenance of the technique back to at least the end of the 18th century. In the Australian context I’d read some references to Punto Perugino having its origins in Sardinia but when I researched all the Italian material I couldn’t find any reference to Sardinia. This left me puzzled so I asked the representatives from the Punti d’Arte Workshop whether there was any connection between Perugino and Sardinia. 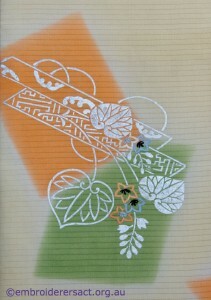 They confirmed that there is no connection between this technique and Sardinia. 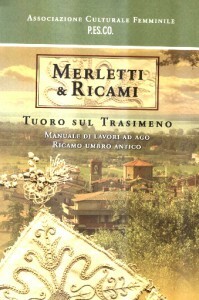 It’s in Italian but the diagrams and instructions are excellent and easy to follow. 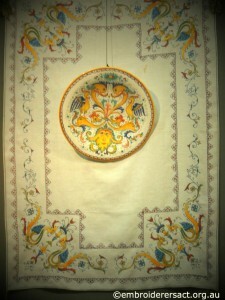 The town of Deruta in Umbria is famous for its ceramics and two lovely styles of embroidery developed there. 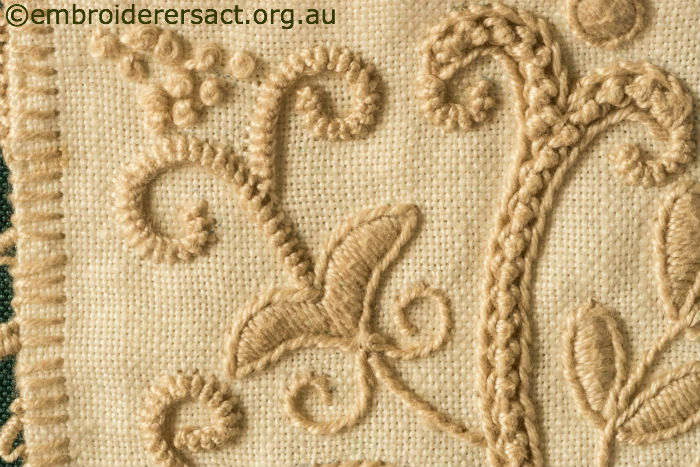 These have medieval roots in the 13th century but like so many other Italian textiles faded and were then revitalised in the early 20th century as part of a more general arts and crafts movement. Another characteristic of this Deruta style is the use of tassels that include a ceramic bead called a fuserole. 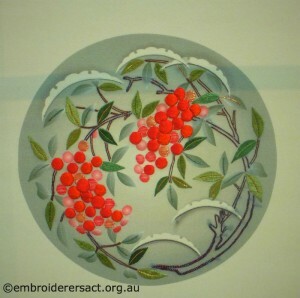 You can see some colourful examples of these beads here on the Italian Needlework site. 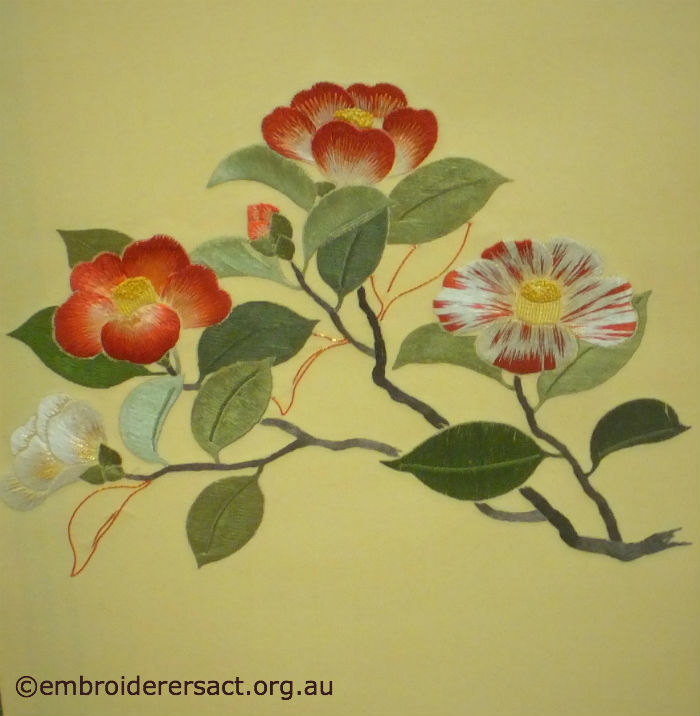 This delicate embroidery technique deserves to be better known…..what do you think? 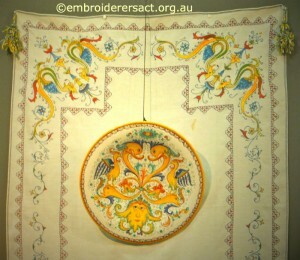 Assisi work is one of the best known Italian embroidery techniques. 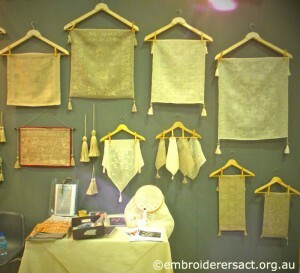 The Accademia Punto Assisi had a large stand at Italia Invita packed with exquisite work both in the traditional Assisi counted technique and in the Punto Madama or Caterina di Medici technique – more about the latter in the next Italia Invita post. You can get more information on the Associazione Punto Assisi here – they have an extensive classes program. 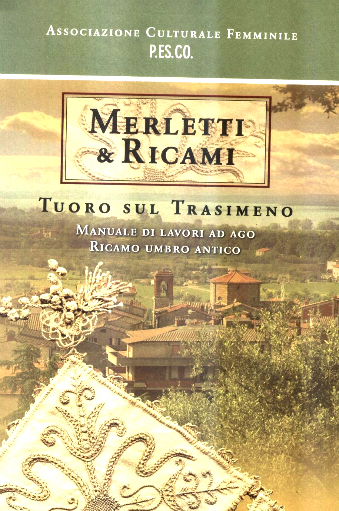 This is a picturesque town about 25 km NW of Perugia on the northern shore of Lake Trasimeno. 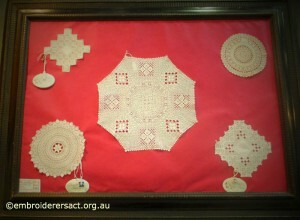 It has an embroidery and lace school run by the Associazione Culturale Femminile P.Es.Co who were also at Italia Invita. 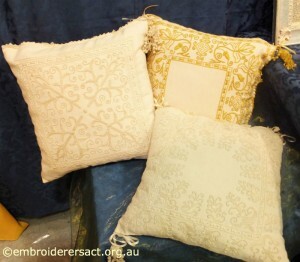 The lace style that has flourished in this area is Irish Crochet Lace. 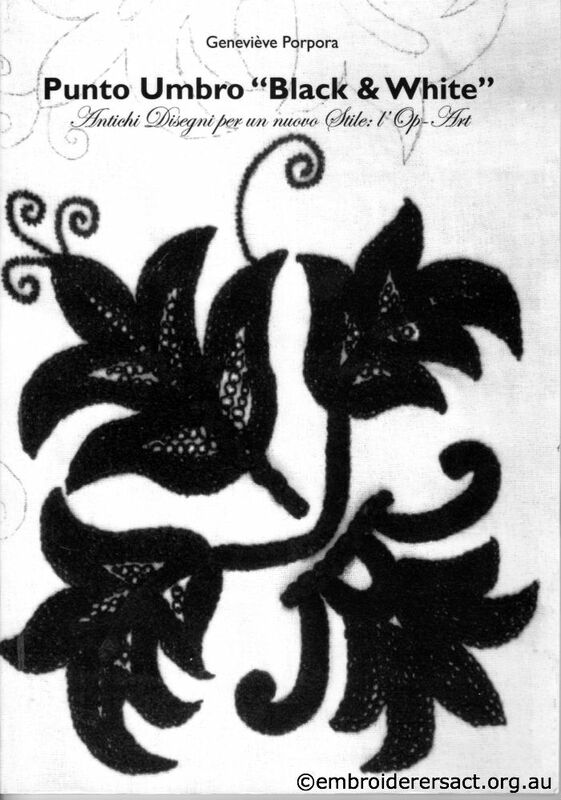 It was introduced here in the early 20th century by Elena Guglielmi, the daughter of the Marchese Giacinto. She thought it was a particularly appropriate technique for the daughters of the local fishermen who were already highly skilled at weaving fishing nets. 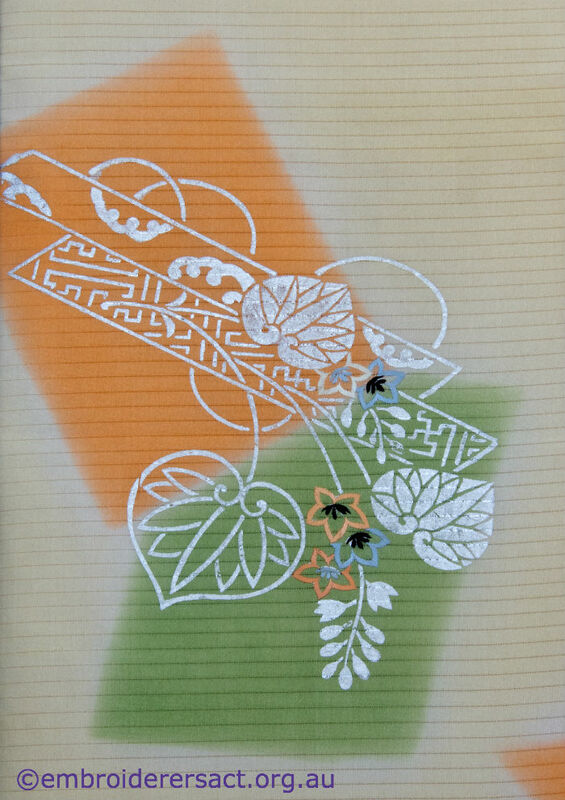 I bought a number of needlebooks in different styles in Italy and what fascinates me is that it’s this one in Punto Umbro that everyone responds to and wants to keep. 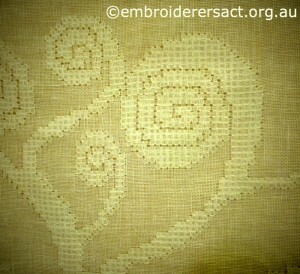 They love the richness of the surface stitches and the tactile quality they give to the piece. 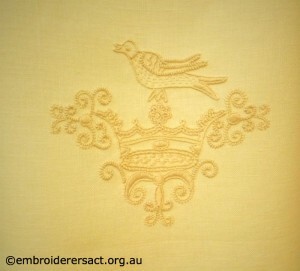 There are two other wonderful embroidery and textile experiences in Perugia. One is the Giudetta Brozzetti Workshop (Museo-Laboratorio di Tessitura a Mano Giudetta Brozzetti) in the city itself. It’s located in the deconsecrated Church of San Francesco delle Donne at Via Tiberio Berardi 5/6, Perugia. This is one of the oldest Franciscan churches in Italy and dates from 1212. 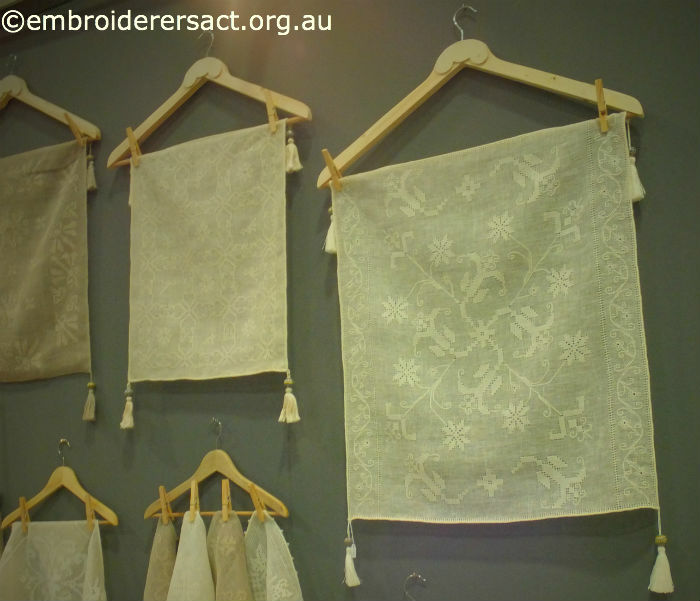 This workshop specialises in handwoven textiles and their work is stunning. 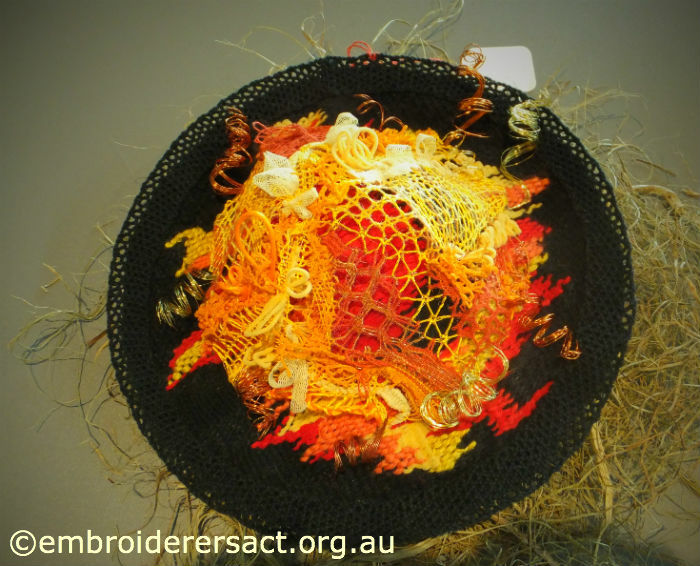 They also offer courses in weaving, embroidery and lace making. 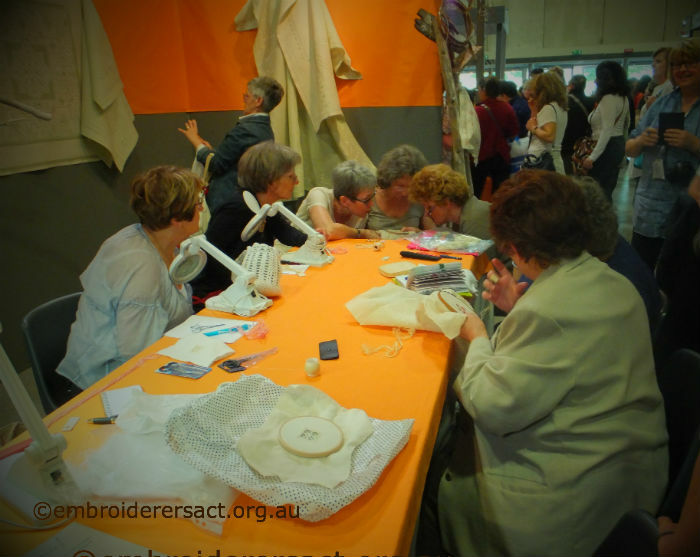 This Workshop was founded by Giudetta Brozzetti in 1921. 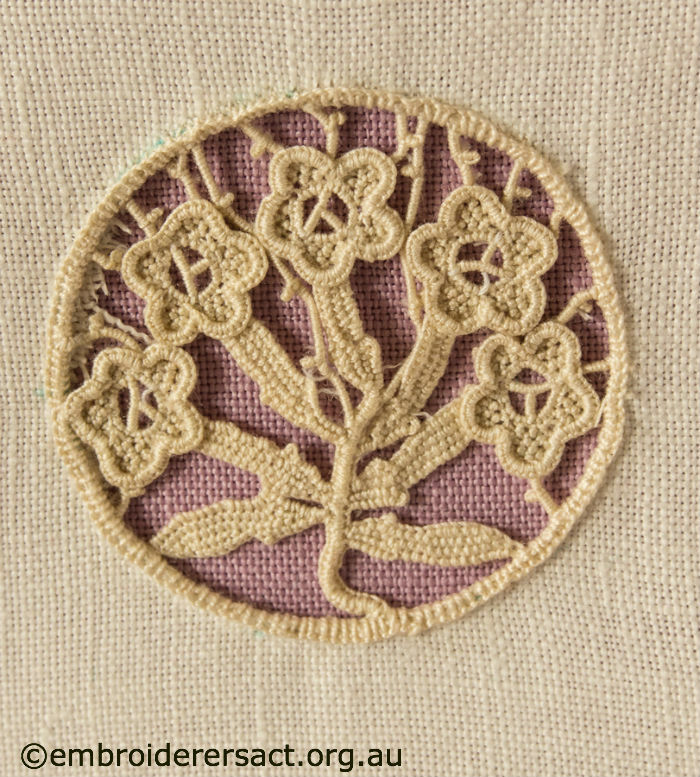 She researched and collected local medieval and Renaissance designs and then got local women to weave them into products for homes and churches. There’s important women’s history here too because she allowed women to work from home so that they could earn a living while caring for their families. You can get more information on their website and Facebook page. 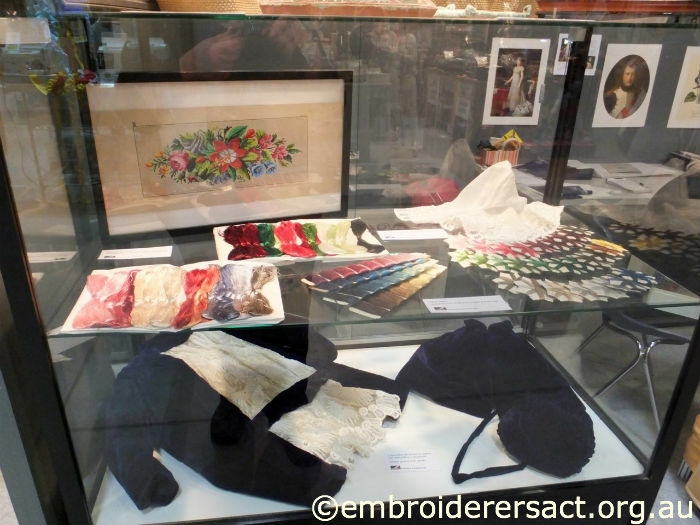 The other wonderful textile experience is the above exhibition (Mostra del Ricamo e del Tessile di Valtopina) at Valtopina in the province of Perugia. 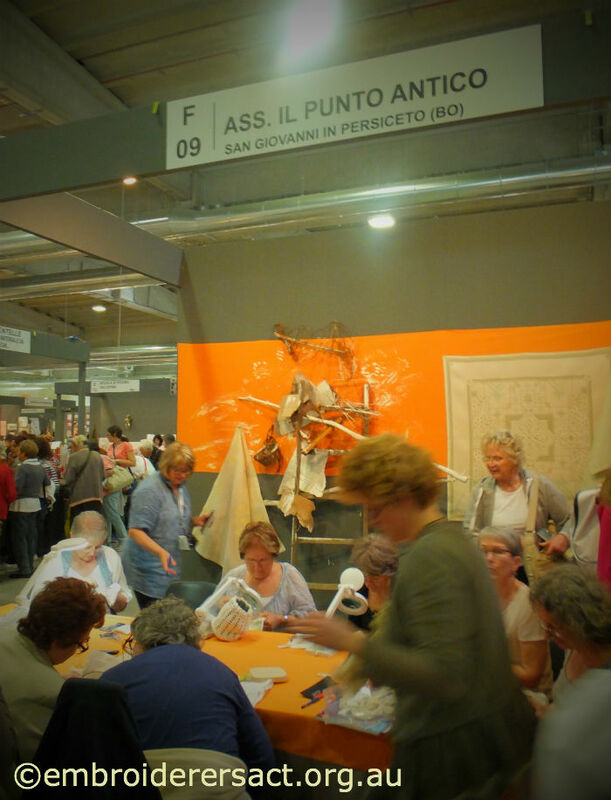 This town is located about 47 km from Perugia and the show usually takes place over 3 days at the end of August – beginning of September. 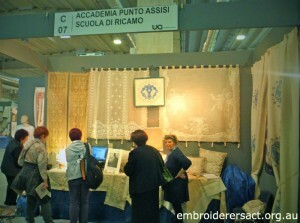 What’s great about this Exhibition is that it includes classes and attracts some of the best teachers from all over Italy. The dates for 2014 aren’t yet on their website or Facebook page but if you’re interested just keep an eye out here. The only information I’ve been able to find out is that the Canadian quilter and textile artist Sandra Redford will be co-curating an exhibit with Joe Lewis at Valtopina 2014. 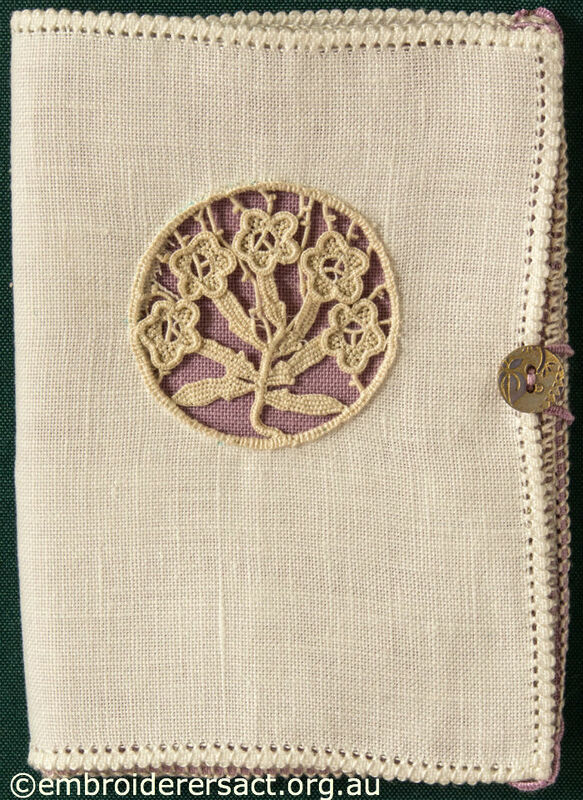 Just to let you know I’ve added some photos of a needlebook with an Aemelia Ars needlelace insert to the Italia Invita 4 post. Somehow I blinked and a whole week has gone! 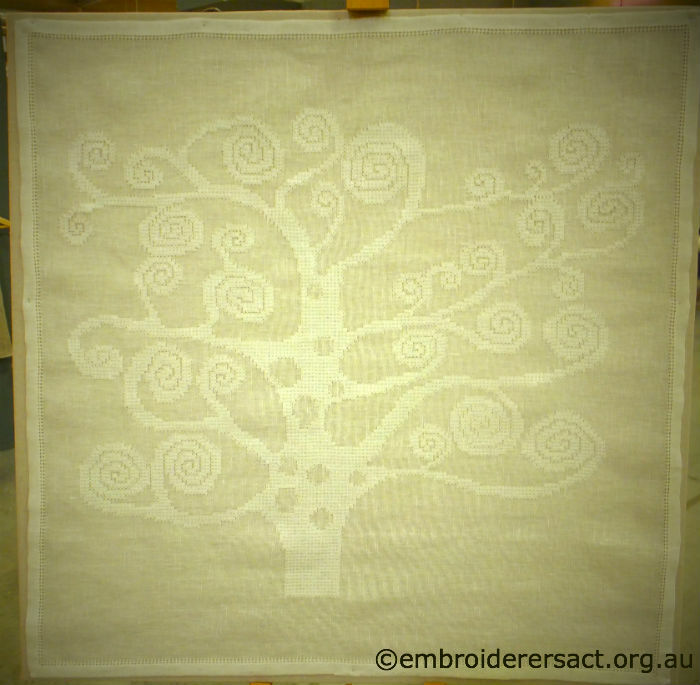 It’s been a busy week with school holiday classes and getting ready for Young Stitchers tomorrow but more about that in the next post. 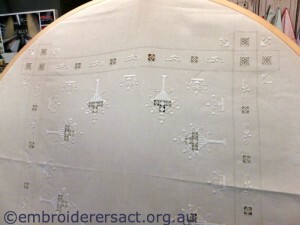 In this post I’m going to focus on Punto Umbro embroidery and Puncetto Needlelace. 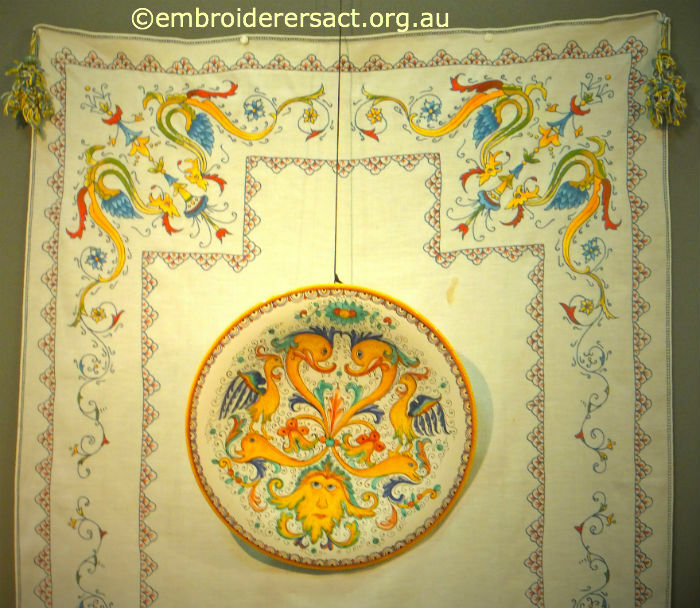 Italia Invita was held in Parma which is in central Italy in the region of Reggio Emilia.The Region of Umbria is also in Central Italy and this meant that quite a number of Umbrian Associations and embroidery schools were represented, mostly from the province of Perugia. 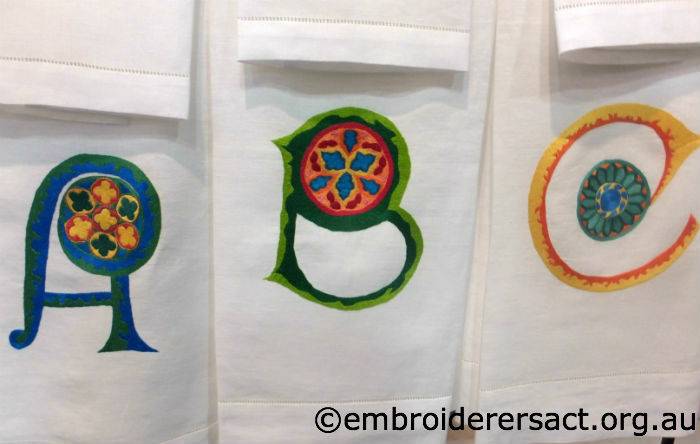 Most people go to Perugia (the city) for its chocolate festival but for stitchers it has the bonus of an incredibly rich textile history – Punto Umbro is just one facet. 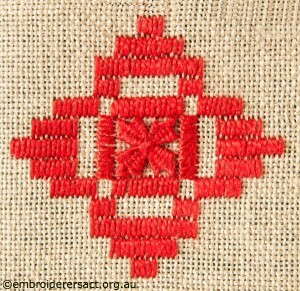 Punto Umbro means Umbrian stitch. 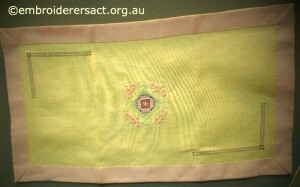 This technique was developed at the turn of the last century by an American woman Romeyne Robert who married an Italian nobleman, the Marquis Ruggero Ranieri di Sorbello. They married in 1902 and went to live at the Palazzo Sorbello in Perugia. 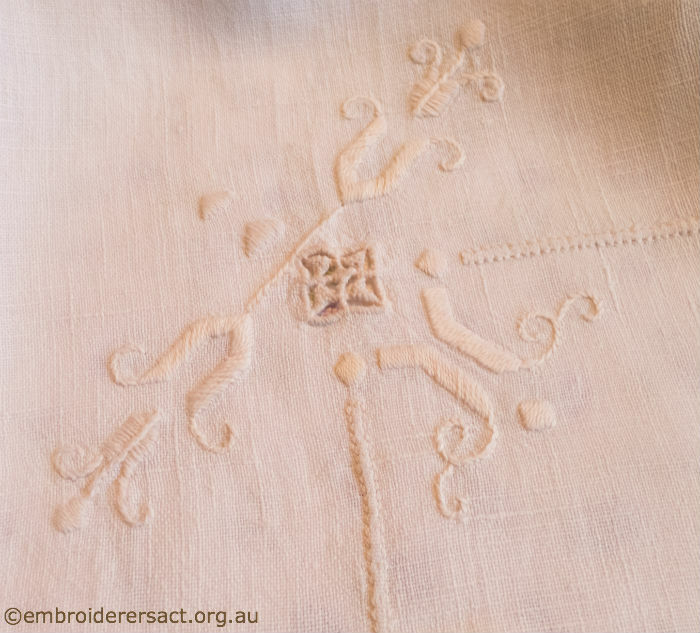 This Palazzo is now a museum and includes some exquisite examples of Punto Umbro embroidery which you can see here. Romeyne Robert established an embroidery school on one of their estates at Villa Pischiello near Lake Trasimeno. The woman she chose to lead the school was a talented needlewoman from Florence called Carolina Amari. These two women made a great team and the school ran very successfully until 1934. 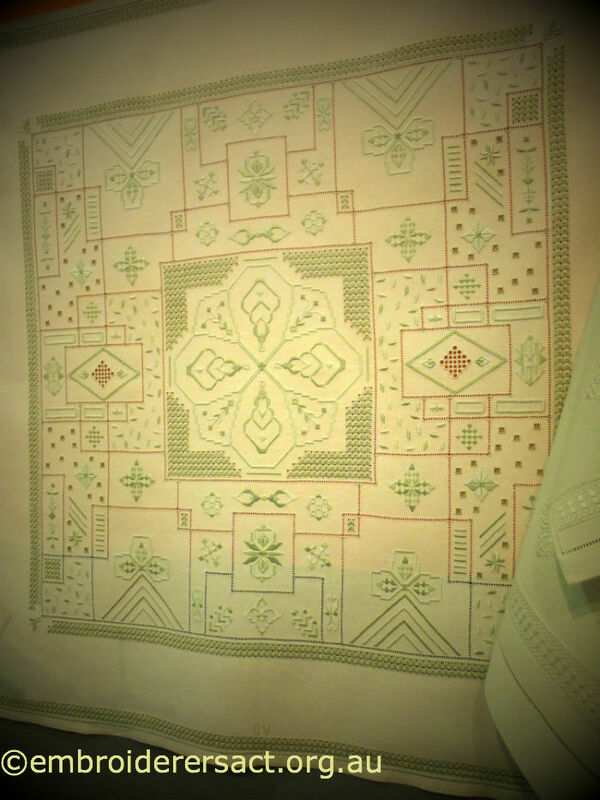 The Punto Umbro technique developed from their study of antique Arab embroideries in the collection of the Countess Edith Bronson Rucellai of Florence. 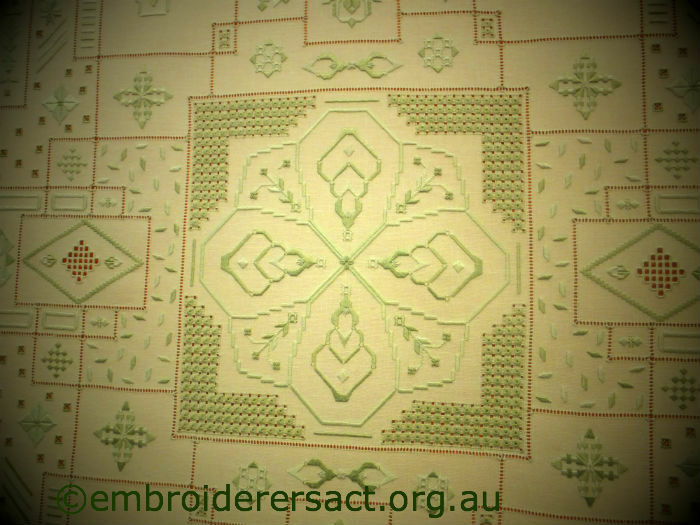 They gave a new lease of life to arabic stitches that had been used in Italian, Spanish and Portuguese embroidery. 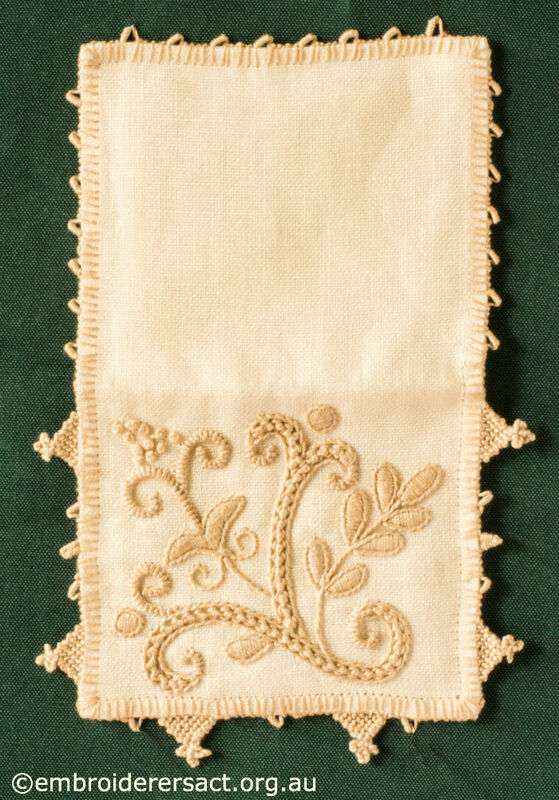 One of the most important was Punto Avorio (Ivory Stitch) which is one of the oldest needlelace stitches brought to Italy by the Arabs. It’s also found in Puncetto needlelace which we’ll talk about a bit later. 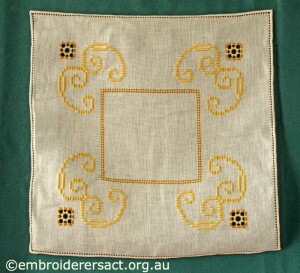 The name of this stitch is said to come from the designs and motifs on the ivory grates in the walls of the harems. 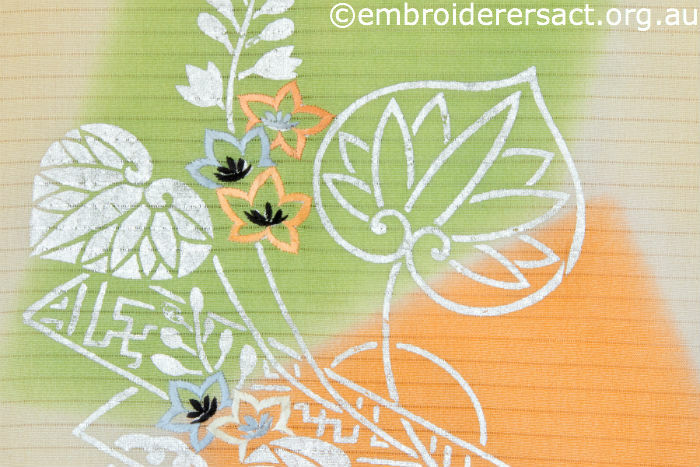 In Punto Umbro it’s used both as a surface stitch and a needlelace stitch. 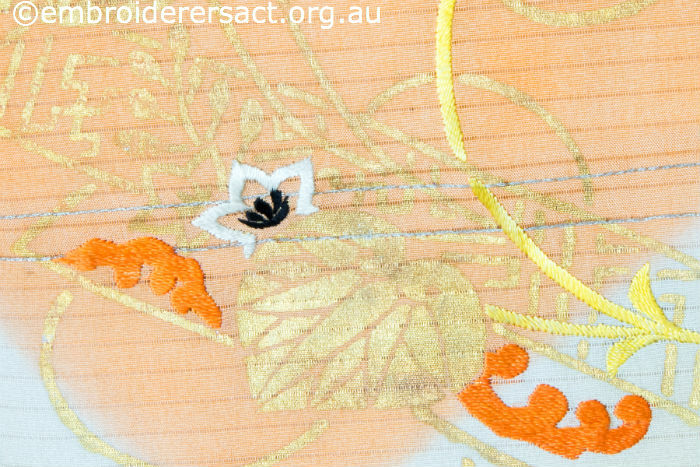 The other characteristic stitch that you can see here is punto ricciolino (little curl stitch) which is used on the curlicues in the flowers and leaves. 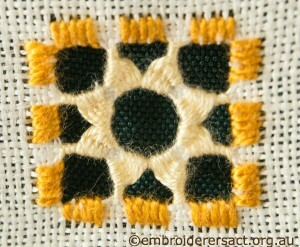 It’s an inverse version of Palestrina stitch. If you’d like a closer look just click on the photo to enlarge it. 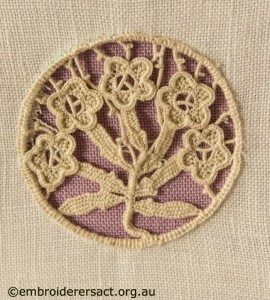 Just as a technique like Crewel is defined by the use of certain fabrics, threads, designs and stitches (i.e. linen/twill, wool threads, Jacobean designs and certain stitches) the same is true of most Italian traditional techniques. 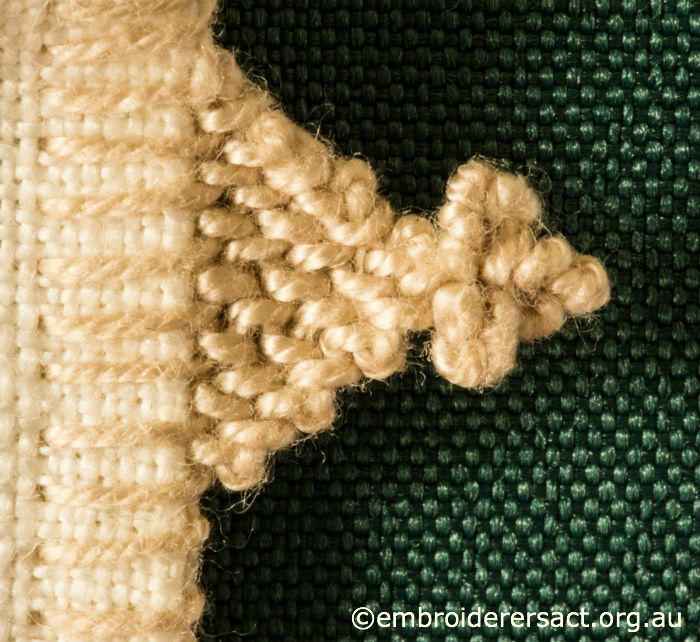 and particular stitches – the most important being satin, stem, chain, punto avorio and punto ricciolino (little curl stitch). This embroidery has a very textured surface created by the extensive use of knotted and filled stitches. 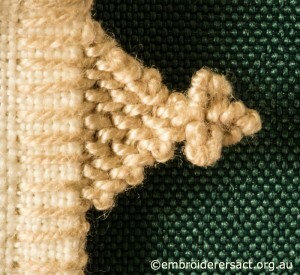 Interestingly herringbone stitch is sometimes used to fill shapes outlined in stem stitch. 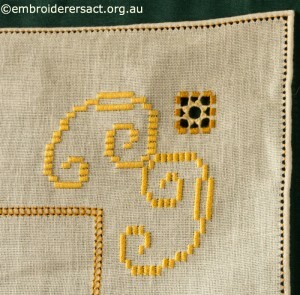 In the more elaborate pieces raised stem stitch is also used to great effect. 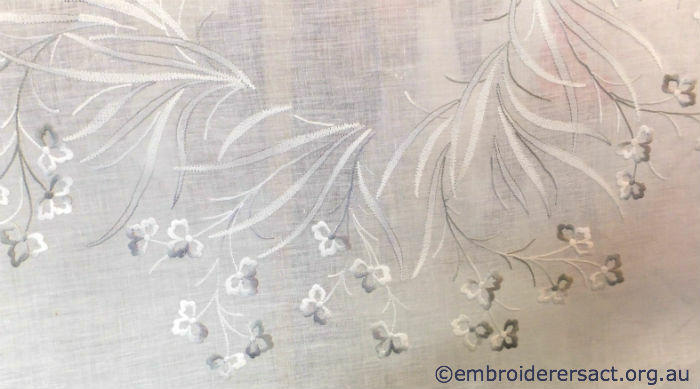 While Punto Umbro doesn’t have the elegance and refinement of Punto Antico, it’s a very attractive style of embroidery because of the elaborate surface, interesting motifs and very tactile quality. There were two stalls with Punto Umbro work at Italia Invita. 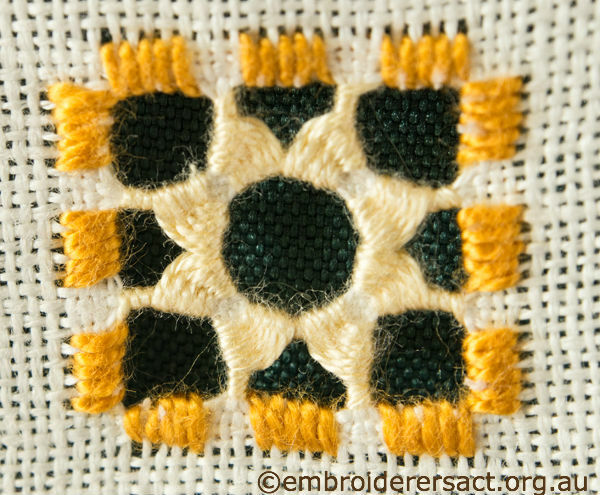 I’m working on a sampler of stitches from this book which also has a very good selection of patterns from easy to more advanced. 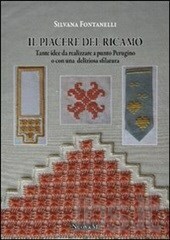 While the text is in Italian the stitch illustrations are excellent. 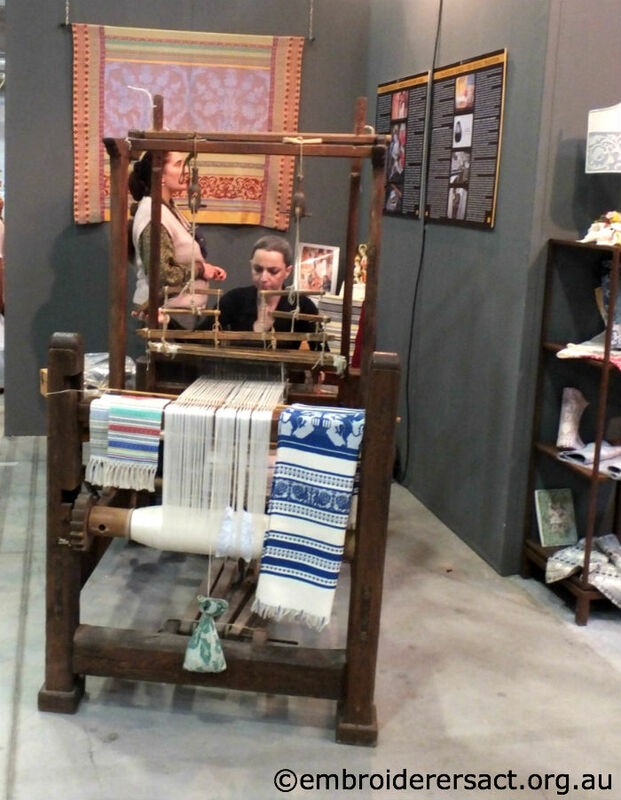 There’s been an interesting conversation going on over time between Giusy Federici and Meri Almeida on the Avomeri blog. 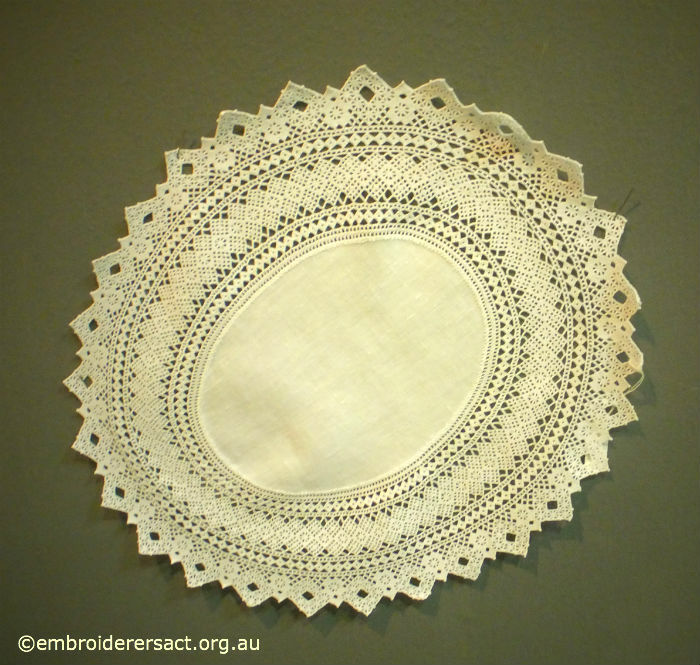 They’ve been exploring the similarities and differences in the stitches and traditions of Portuguese embroidery and Punto Umbro – most recently in a post on 28 August 2013. 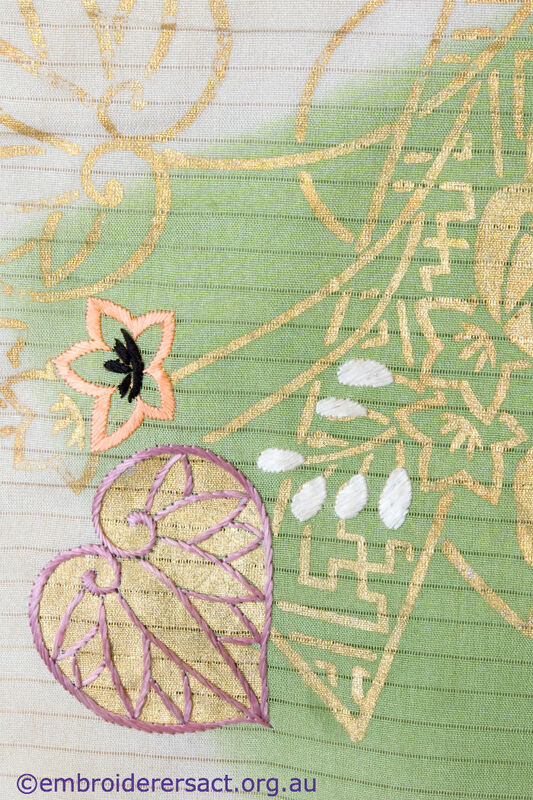 You can see the Sampler from Giusy’s book in Meri’s post of 7 December 2012 – the easiest way to get to this post quickly is to go to the ‘search’ box at the top right hand side of the blog header and key in ‘Giusy Federici’ then hit the return key and then go to the post. The other stand belonged to a woman from Perugia called Genevieve Porpora. She recounted that she learnt Punto Umbro from Margherita Biancacalana, the last surviving student of the Marquess Romeyne Robert’s school. Genevieve Porpora has also published a book on Punto Umbro with a modern twist – some of the traditional patterns are stitched in black on white. 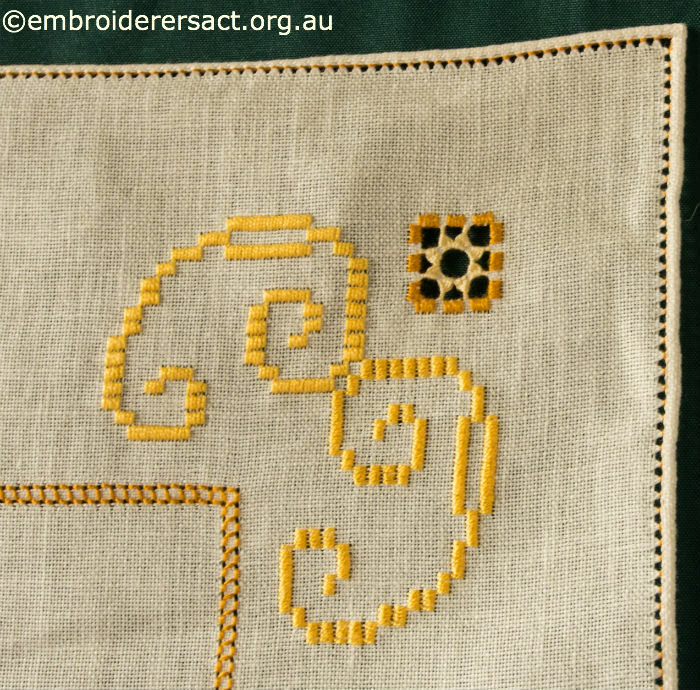 Again the text is in Italian and I’ve found that the stitch diagrams are not as detailed or helpful as those in Giusy Federici’s book. 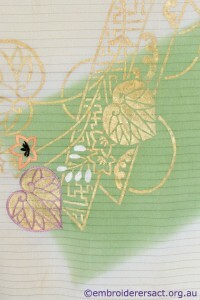 I bought this book for the patterns which include a number with birds. These can be worked either in the black or the traditional thread colours. 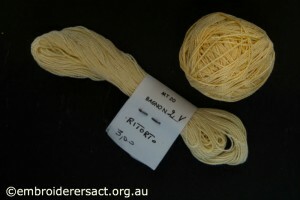 Punto Avorio links Punto Umbro and Puncetto needlelace. 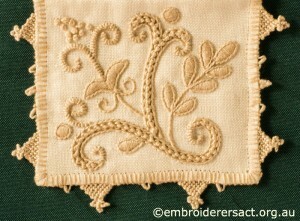 This style of needlelace is used in the insertions and edgings of Punto Umbro work. 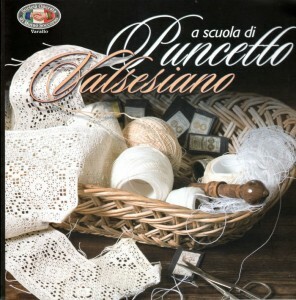 Puncetto is a knotted needlelace made using only needle and thread. 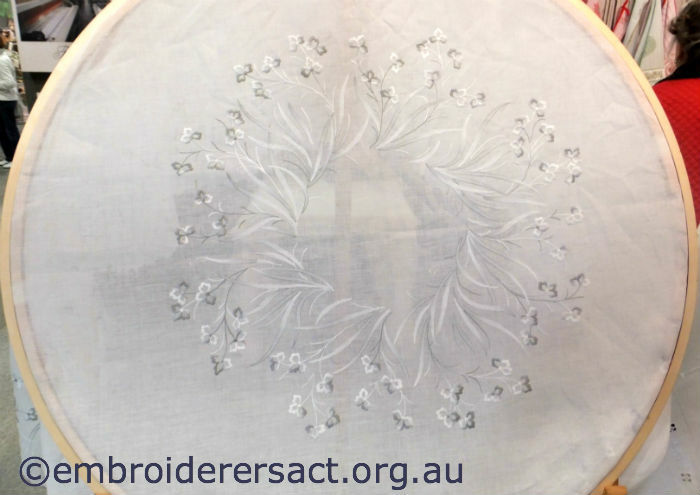 You don’t use a hoop as there aren’t the same issues of maintaining tension that exist in needlelace styles based on buttonhole stitch. I haven’t yet had a chance to use this book but it’s based on very extensive and detailed diagrams. 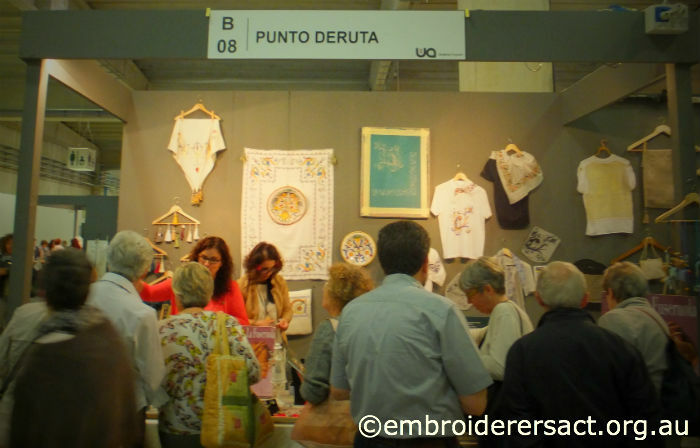 If you’re interested in more information on either Punto Umbro or Puncetto then head to the blog Italian Needlework. If you scroll down the left hand side of the blog you’ll see the extensive list of headings. What makes Italia Invita special are all the regional associations and embroidery schools that come to demonstrate and share their traditional embroideries, laces and textiles. One of the most popular traditional styles is Punto Antico. 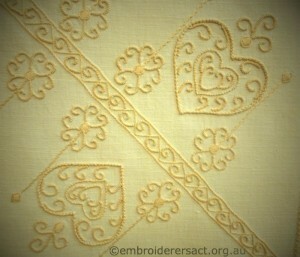 Punto Antico means Antique Stitch and it’s a traditional technique used for centuries in Italy to decorate household and personal linens. It’s still used extensively today. 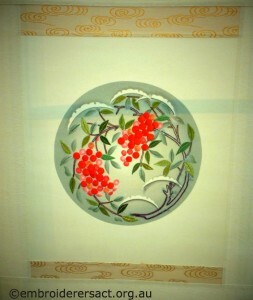 You often see it on the long narrow curtains in homes and restaurants but also on tablecloths, napkins and table runners. If you want to look at this photo or the others in this post in more detail just click on them to enlarge. In the past Punto Antico was done in white on white or ecru on white but increasingly it’s being stitched in colour. 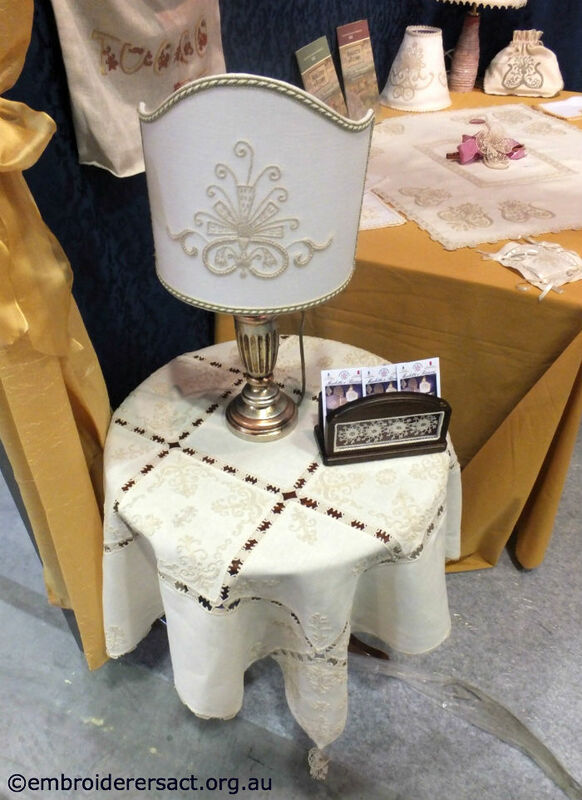 This shift of traditional embroidery and lace from whitework to the use of colour was one of the clearest trends at Italia Invita. 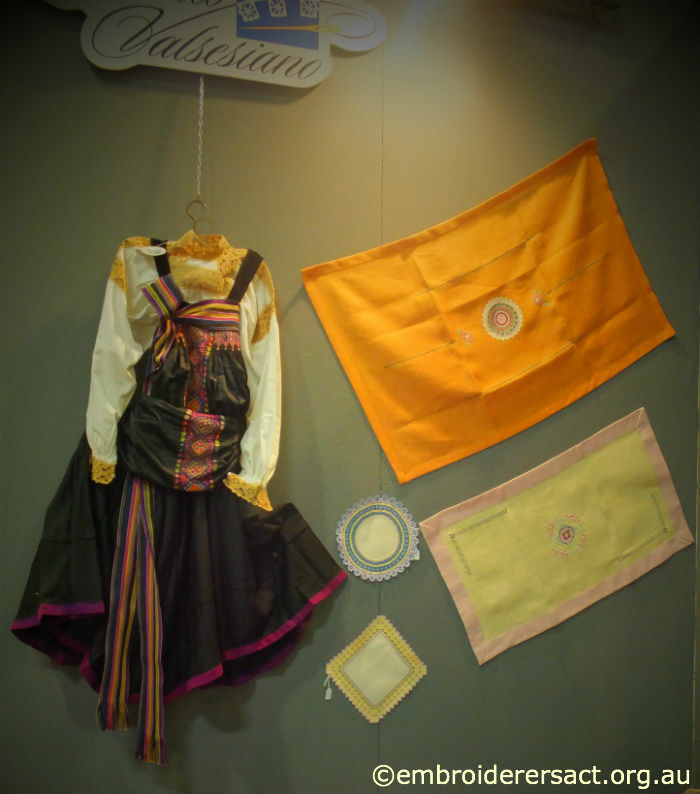 Is Punto Antico the Italian Hardanger? 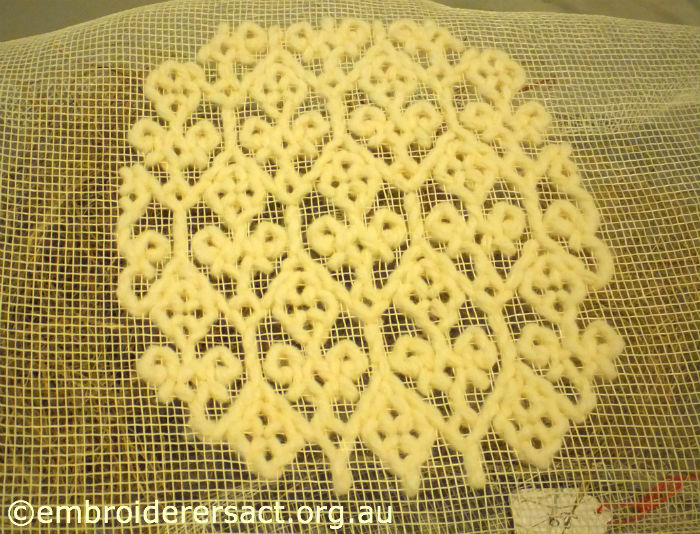 ….quickly dispels this impression as the stitches used are different to Hardanger and the needlelace insertions are in Reticello, Punto in Aria and/or Aemilia Ars. 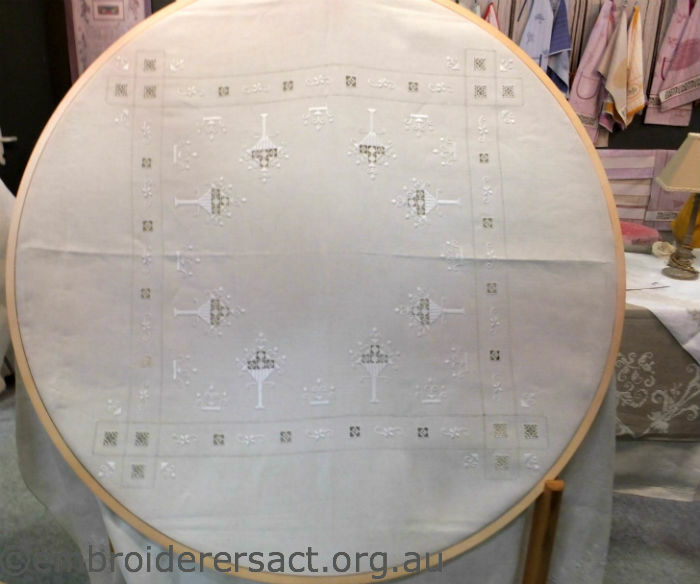 Jeanine Robertson has written a detailed article on Punto Antico for Piecework Magazine including a comparison with Hardanger and you can read it here. 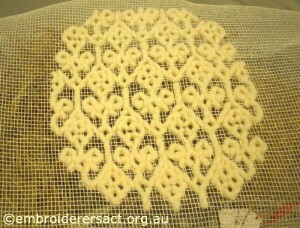 Reticello means ‘little net’ in Italian and is a form of embroidery that’s been recorded since the late Middle Ages. 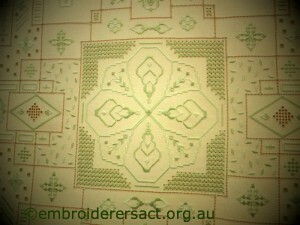 It’s created by drawing threads from a fabric and then refilling the spaces with stitched motifs in geometric designs. 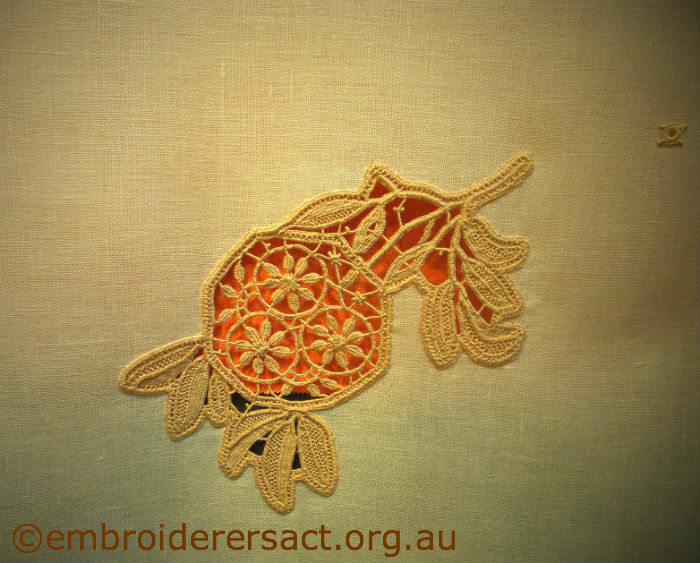 Historically it’s regarded as the transition point between embroidery and needlelace. 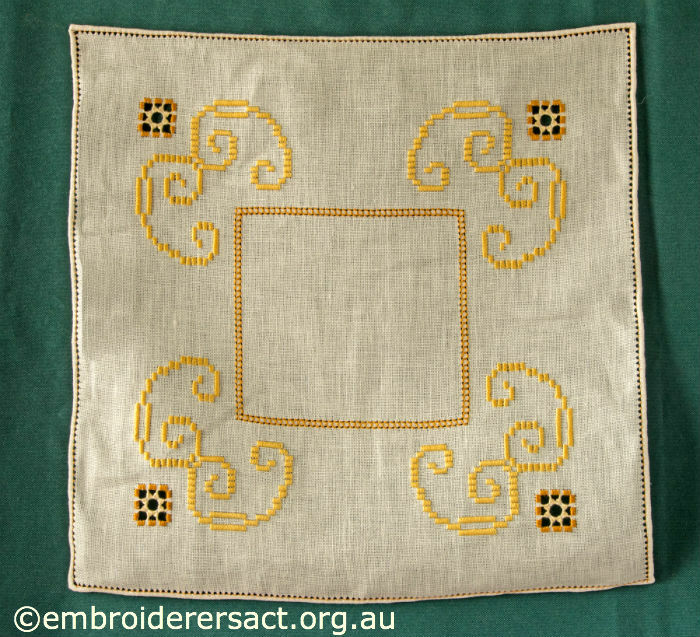 As the Reticello patterns and motifs became more complex more and more threads had to be withdrawn and the inserts became flimsier. 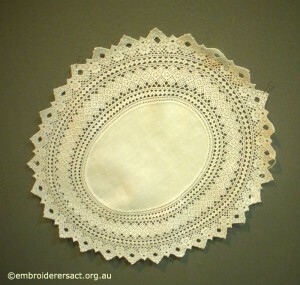 As a result the lace makers created the Punto in Aria technique which is regarded as the first true needlelace. 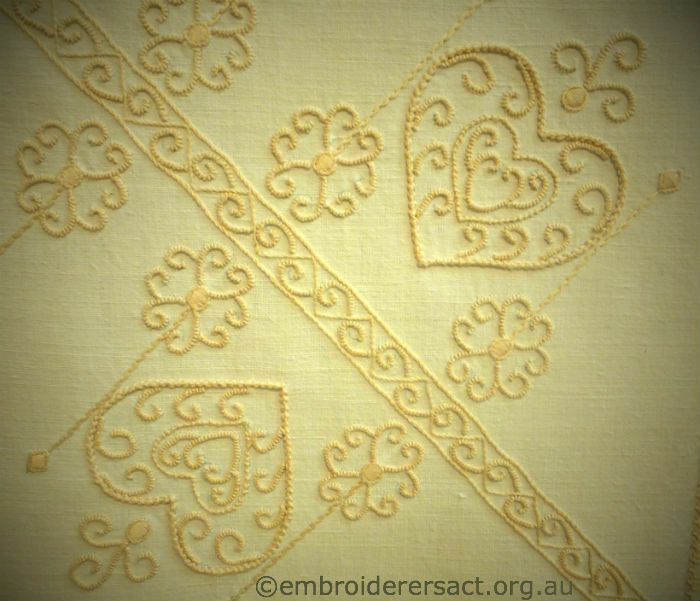 Punto in Aria means ‘stitch in the air’ and refers to the fact that the lace is not created on fabric – it’s done on fixed threads on a temporary support usually parchment or a special type of paper. 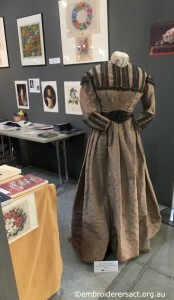 They went out of fashion at the end of the 17th century and were revived at the beginning of the last century by the Aemilia Ars Society in Bologna. 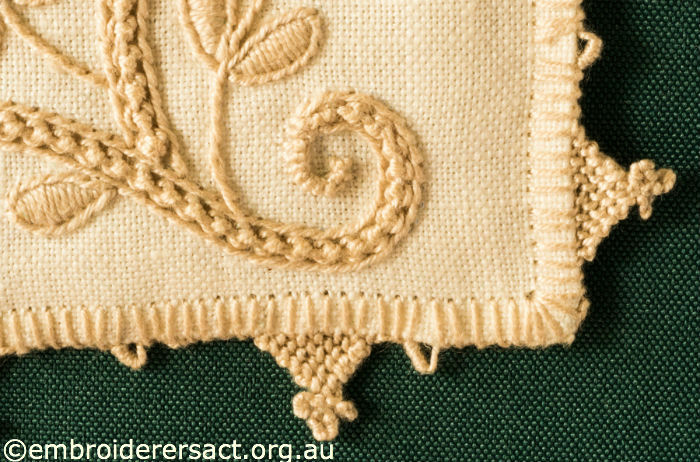 This group is often compared to the Arts and Crafts Movement in England and it had some success in reviving needlelace traditions. 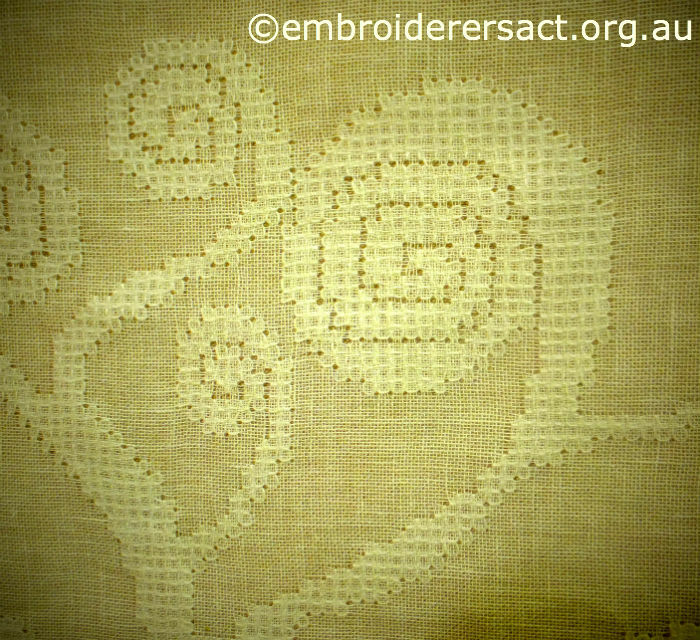 The term Aemilia Ars is used today to refer to the needlelace style that evolved from Punto in Aria. The women manning the stall were very generous in allowing me to take photos of the work on display. 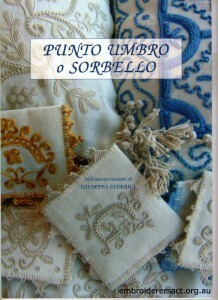 Bruna Gubbini has written a number of books on Punto Antico which include a text in English as well as Italian and French. 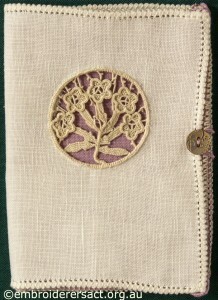 The Guild’s library has five of these and they are full of wonderful designs and very clear instructions on how to do the stitches and needlelace. She is also a leading member of the Associazone Il Punto Antico from San Giovanni in Persiceto and she was teaching at Italia Invita but better still……. ….the linen manufacturers Fratelli Graziano had commissioned her to stitch two tablecloths to display on their stall. You can see them in those giant hoops above. They were both jawdroppingly beautiful with a flawless technique and were widely admired. 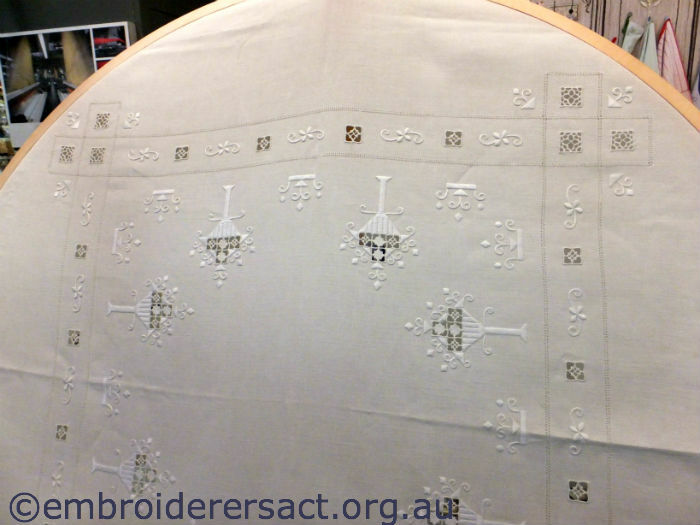 If you’re looking for more information on Punto Antico, Reticello or Aemilia Ars then head over to Jeanine Robertson’s blog Italian Needlework. If you scroll down the left hand side of her blog you’ll find a comprehensive list of topics covered. 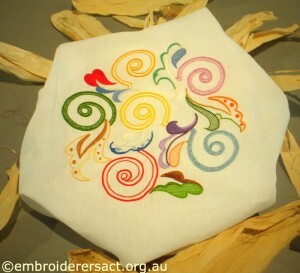 Jeanine has also designed a Punto Antico Biscornu freebie and you can get it here. 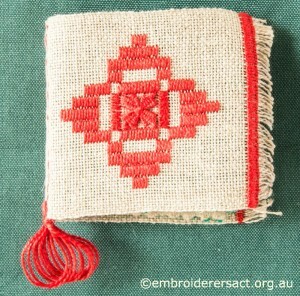 What do you think of the Punto Antico and Reticello techniques? 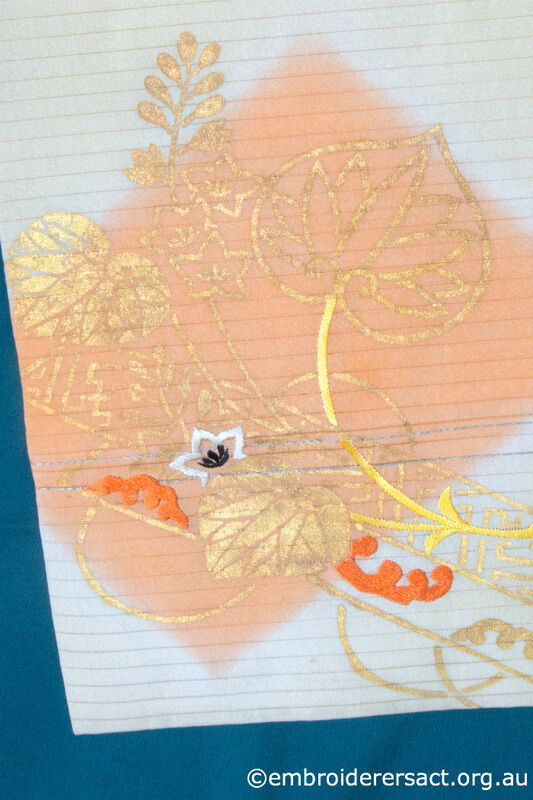 Do you have a favourite among the works in this post? 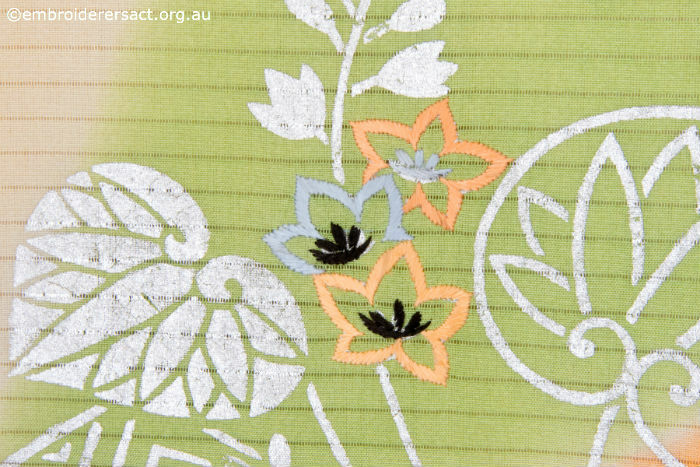 If you feel like leaving a comment we’d love to hear from you. 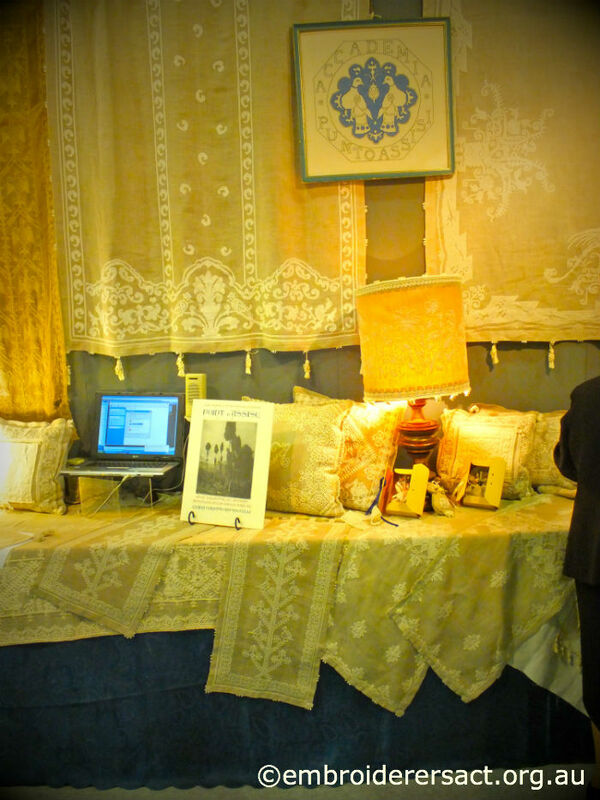 There were a couple of special museum exhibits at Italia Invita 2013. 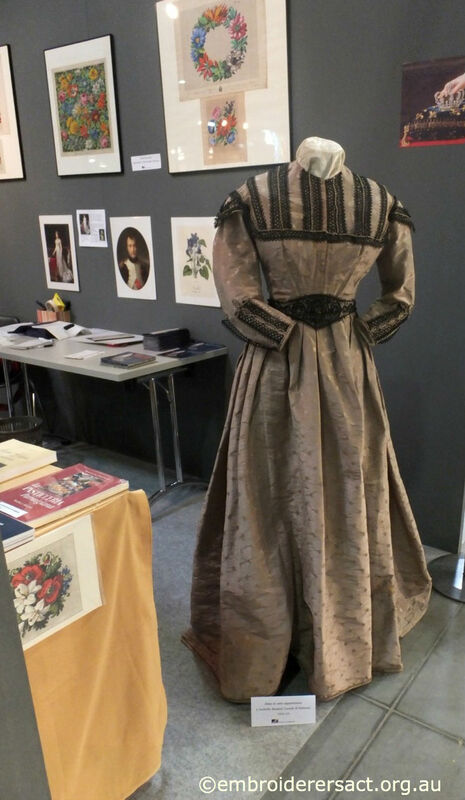 One of them was this Museum which is located in Parma and focuses on the cultural heritage of Bourbon rule and in particular that of Maria Luigia of Hapsburg (1791-1847). 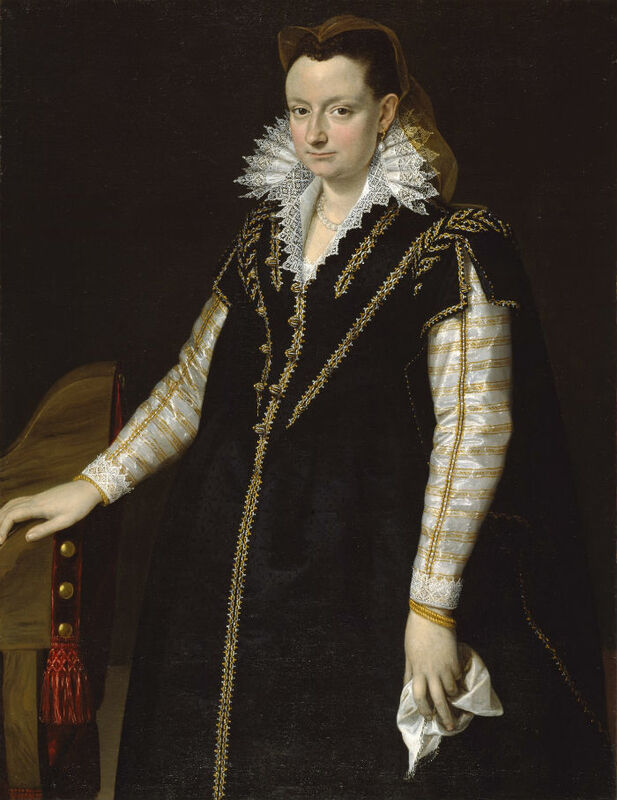 Maria Luigia was the oldest child of Franz 1st Emperor of Austria and Maria Teresa of the Two Sicilies. As part of a set of diplomatic moves she married Napoleon in 1810. 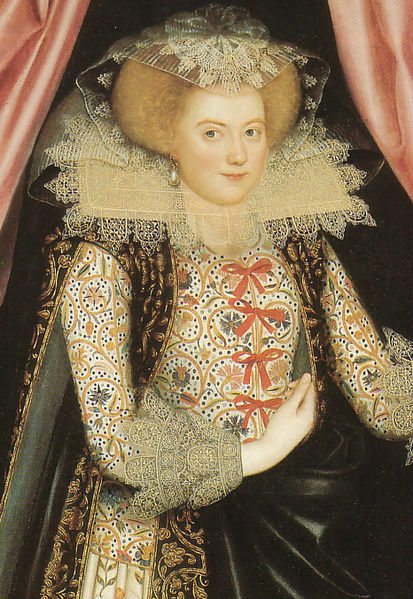 In 1815 the Congress of Vienna assigned her the Duchy of Parma, Piacenza and Guastalla and she arrived in Parma in 1816. Here you can see the scissors and tools she used to create the cross stitch of flowers. 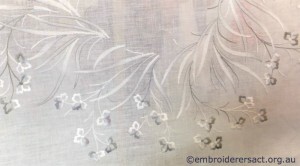 While in this photo we see her silk threads and a design for an embroidery. My apologies for the quality of the photo but it was impossible to avoid the reflections. I found these personal objects very moving – they gave you a sense of her as a person and not just a historical figure. This was reinforced when we later went to the Museum itself and saw her watercolours and artefacts from other pastimes. This is a gem of a museum and worth visiting if you’re in Parma. 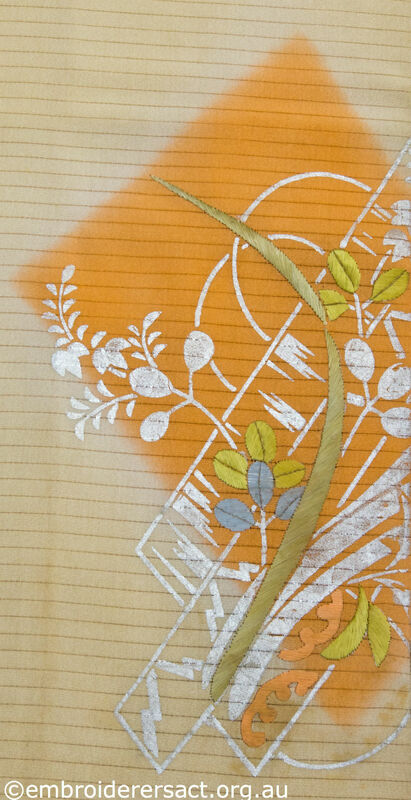 It came about as the result of the passion, energy and tenacity of Professor Glauco Lombardi (1881-1970). Maria Luigia lived in turbulent times politically and after 1831 Austrian rule of Parma and other parts of Italy came under increasing attack from revolutionary uprisings – this period is known in Italian history as the Risorgimento. Over time the artefacts and objects belonging to Maria Luigia were dispersed in various Savoy palaces. And this is where they remained until Professor Lombardi collected them and persuaded the relevant authorities to set up and fund the museum. It’s an inspiring story. If by any chance you’re going to be in Parma on 29 September the Museo Glauco Lombardi will be holding an event dedicated to the lace of Emilia Romagna and Tuscany in the first half of the 19th century. 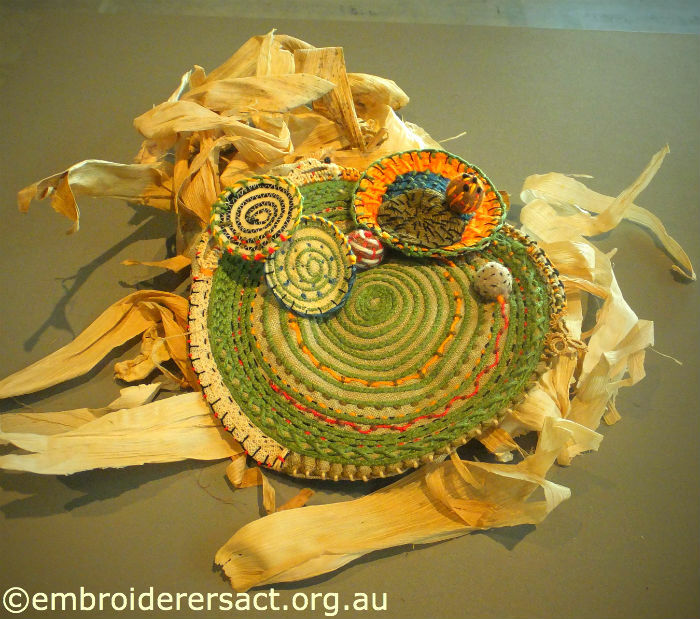 You can find the Museum’s website here. This was a small exhibition put on by a group called La Congrega from Ancona in the Marche region of Italy. Ancona is a port city on the Adriatic Sea and has a rich maritime history as a centre of trade. 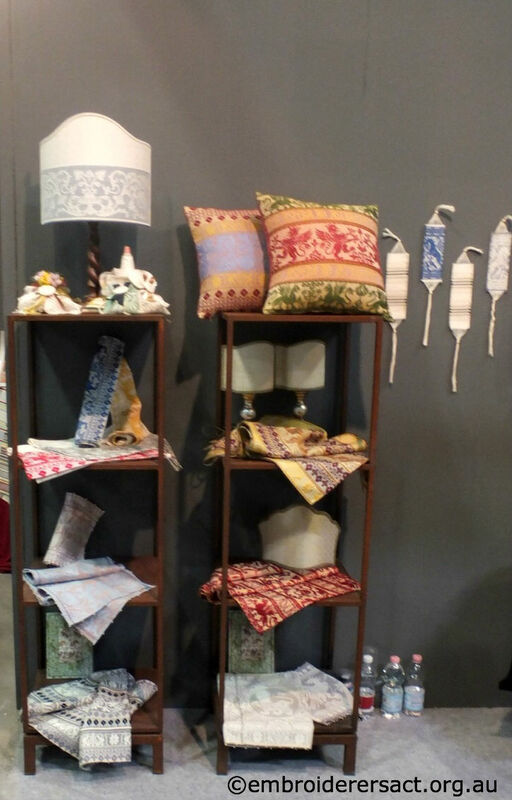 La Congrega is a textile group that conserves, recycles and repurposes antique and second hand textiles. According to their website they are in the process of studying and cataloguing a data bank of some 2500 textiles. 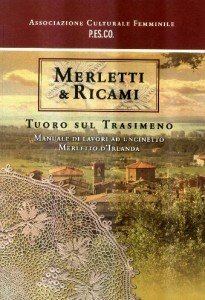 This was an intriguing show that took you back to Ancona in the second half of the 16th century. 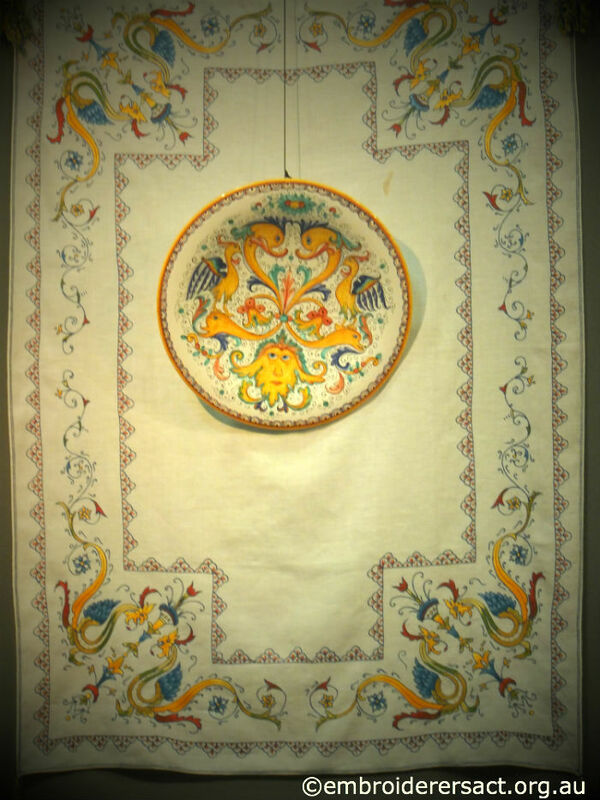 In this period Ancona was a trade hub and a melting pot of peoples from all around the Mediterranean who brought with them a rich diversity of textiles – tapestries, carpets, clothing, fabrics and fibres. 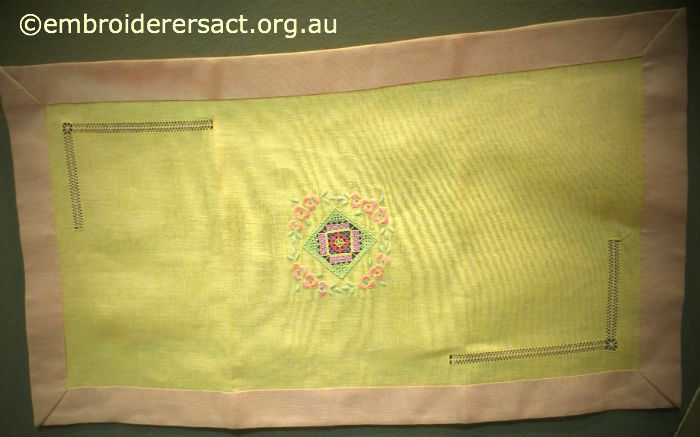 The purpose was to show how this mix of people, cultures and trade influenced textile design and the sharing of motifs, styles, stitches and techniques around the Mediterranean. It was very thoughtfully put together. From now on I’ll be concentrating on the various embroidery techniques and traditions shown at Italia Invita starting with Punto Antico and Reticello in the next post. 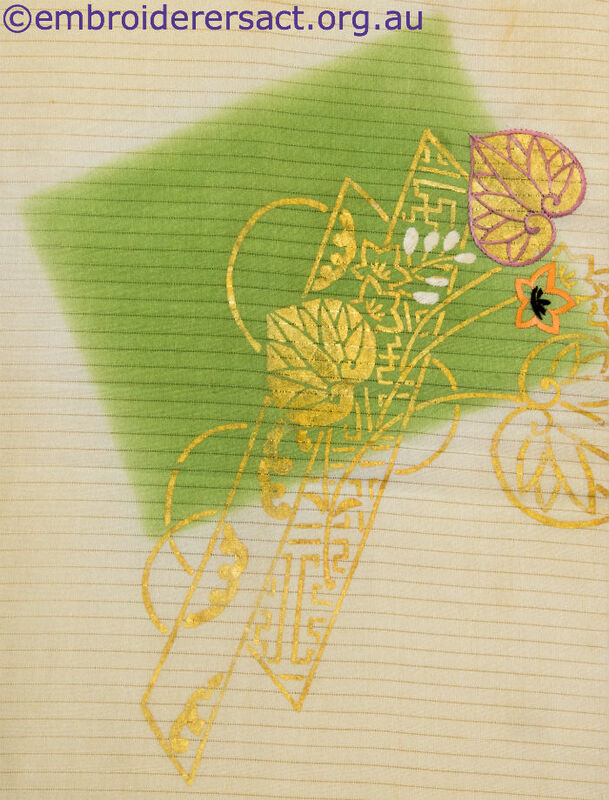 Before starting this new topic I’d like to go back to the previous Italia Invita post on the Japanese quilt artist Noriko Endo and confetti naturescapes. 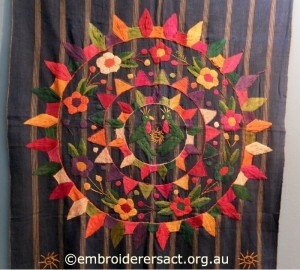 Carolyn Foley of the Caro-rose blog commented that Noriko Endo and an Australian quilter, Ruth Bloomfield, began working on confetti quilts at around the same time and independently of each other. 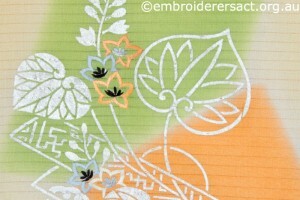 She includes a link to a behind the scenes look at Ruth Bloomfield’s work in her comment – go to the comments section of the previous post and check it out if you’re interested in a different approach to this technique. 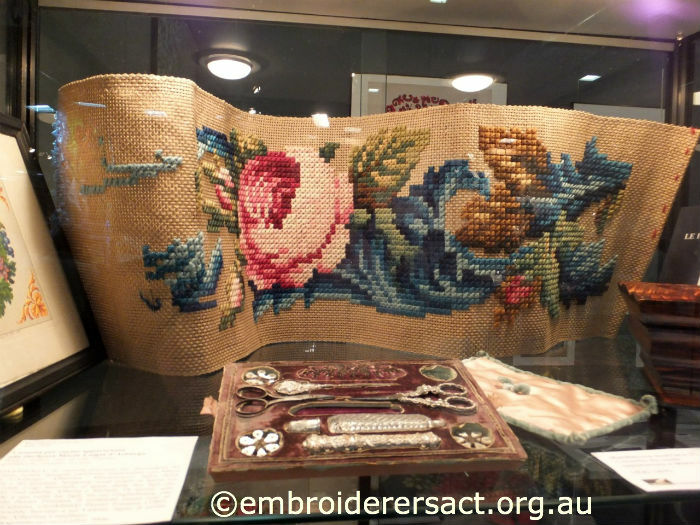 This was a national needlework competition for embroidery, lace or weaving. The requirements were that participants interpret their idea of internationalism in a circle of textile material or woven fibres of different kinds. The work had to be original and not previously exhibited. 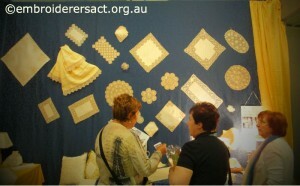 There was a very interesting range of entries. Each work was about the size of a dinner plate. 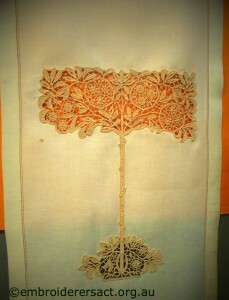 First prize went to this work called L’albero/The Tree by the group Atelier Merletto di Orvieto. Orvieto is a small city in Umbria in central Italy and has one of the most dramatic locations in Italy – it sits on top of vertical cliffs that rise up over the surrounding plain. Because its setting made Orvieto a fortress it has rich layers of history – Etruscan, Roman, Medieval and Renaissance. 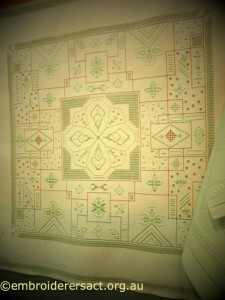 It’s also part of the very rich needlework history of Umbria. 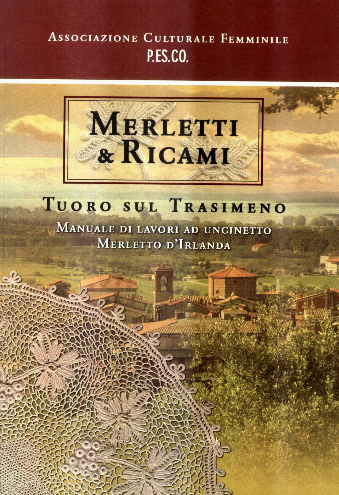 Merletto is an Italian word for lace. Orvieto lace is a type of crochet lace with strong bas relief (raised) elements in the designs – in this case the tree motif. 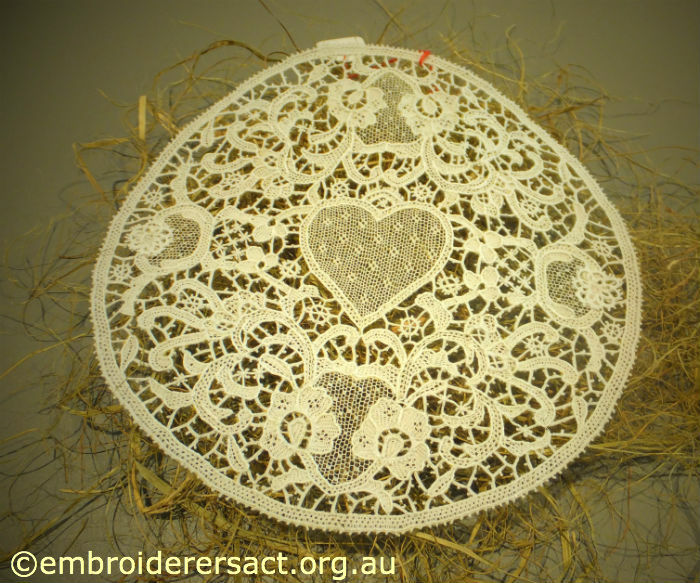 The traditional bas relief motifs for this type of lace are based on those on the facade of Orvieto cathedral and include leaves, acanthus, vines, flowers, animals and figures. 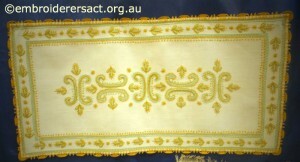 The bas relief effect is achieved by shaping the motifs with special irons. This must be a risky and difficult process for a beginner! This competition piece was exquisite. 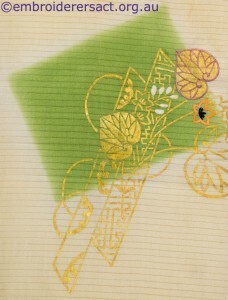 The jury notes comment that it takes traditional needlework and interprets it in a contemporary way relevant to the theme of the competition. 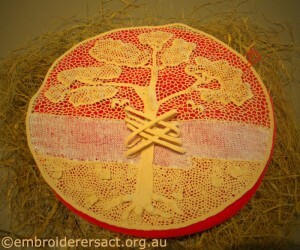 They also liked the refined three dimensional presentation of the tree motif. 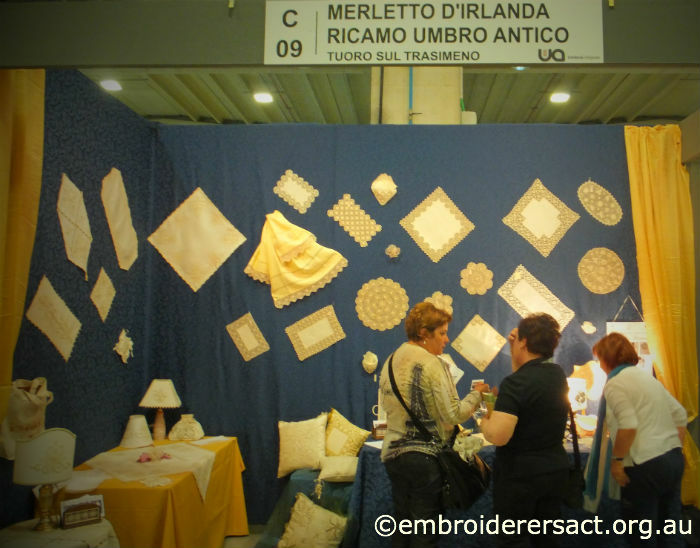 The Atelier Merletto di Orvieto had a booth at Italia Invita with beautiful work on display as well as information on their classes. 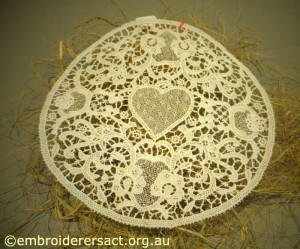 Unfortunately they also had a sign up asking people not to take photos so I can’t show you any other examples of their lace. This piece was called ‘Ma che strano questo mondo..’/But how strange is this world… and was by Emanuela Micucci. The jury commended it for the originality of its design and colour composition and the fact that it was a fusion of different techniques. 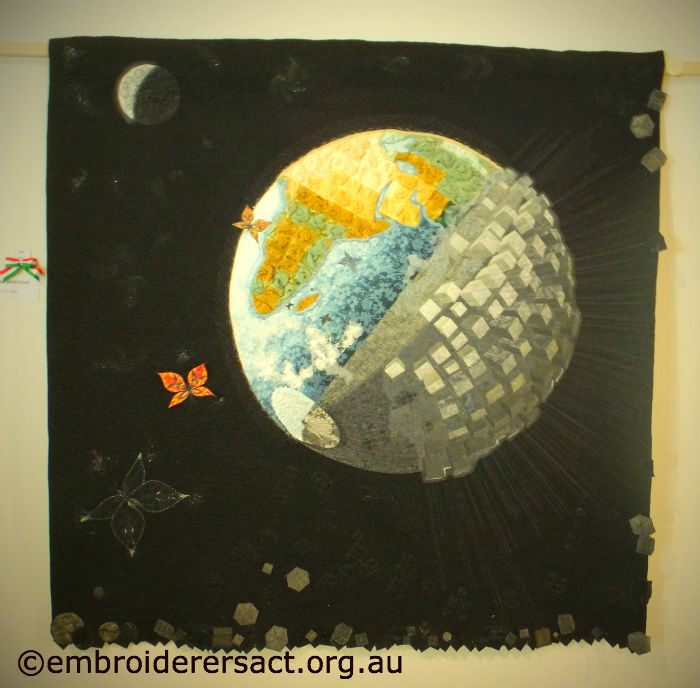 Third prize also went to a contemporary piece called ‘il sole luminoso, vitale e internazionale’/ the sun – bright, vital and international by Maria Grazia Giacomini. The jury highlighted the range of natural and metallic fibres and weaving techniques used to create a very original work. 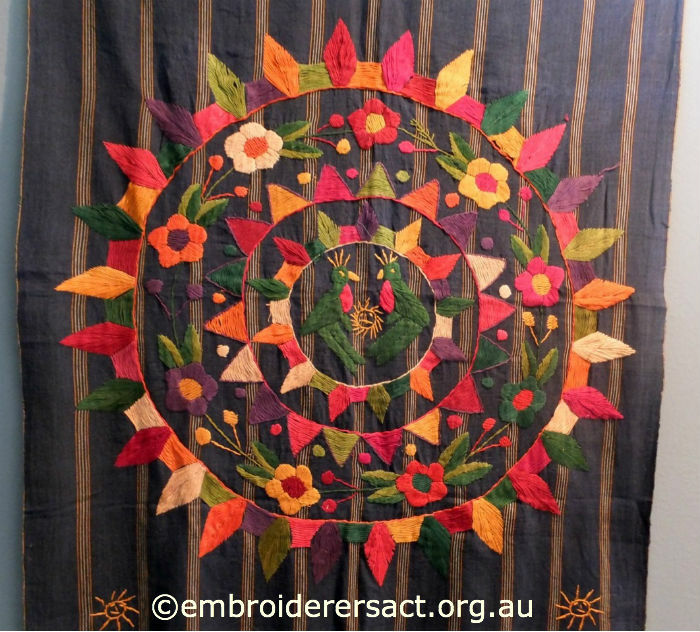 The theme for this national quilt competition was La Quadratura del Cerchio/ Squaring the Circle and here’s the winner of the art quilt section. If you’re looking for a small project to do over the weekend then head over to Anna Scott’s blog and her post of 3 September. 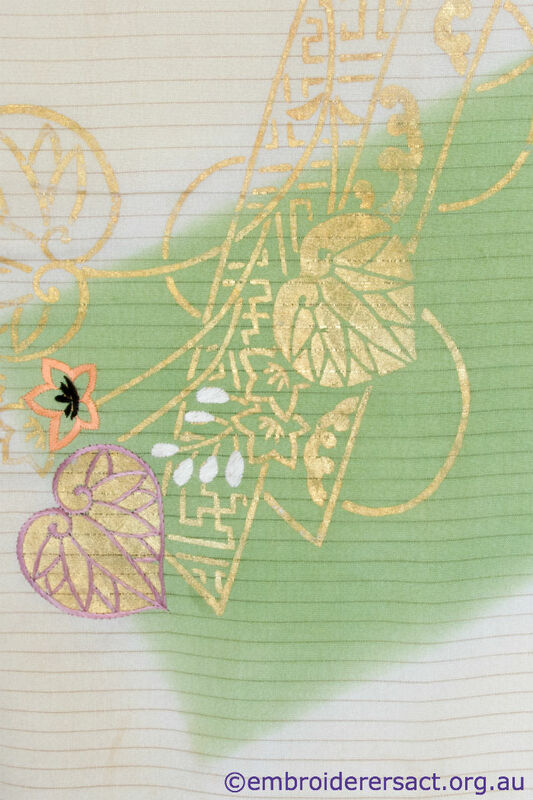 She’s gifting readers a small hearts and flowers design for a scissor keep, Christmas ornament or whatever takes your fancy!